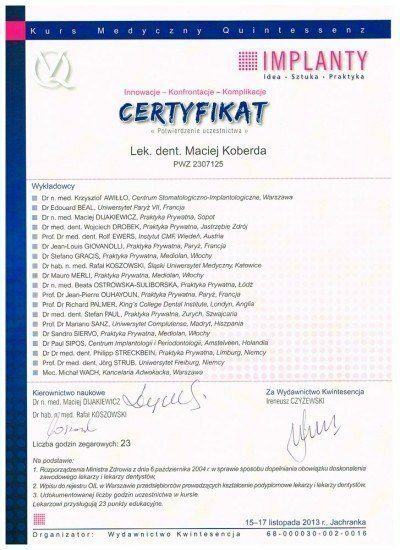 We are Subjected to European Legislation and Regulations and Have Been Accredited, Certified or Registered with the Following Organizations and Government Bodies. 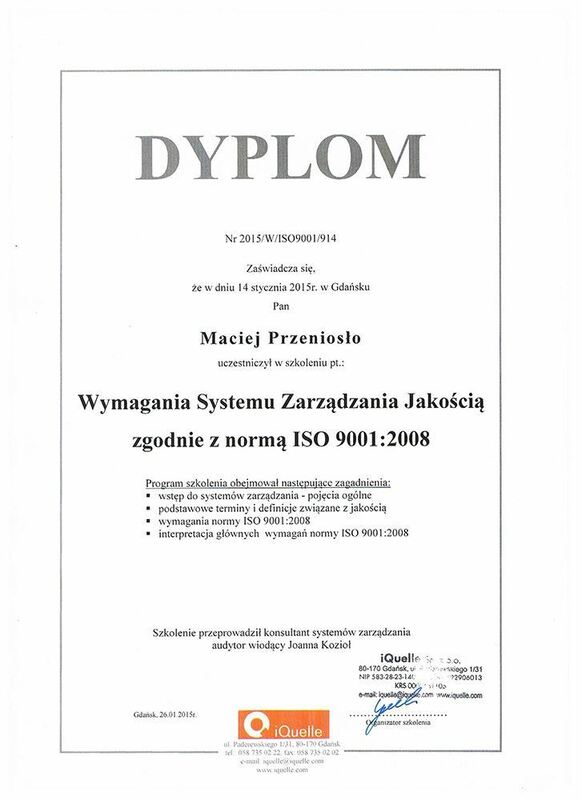 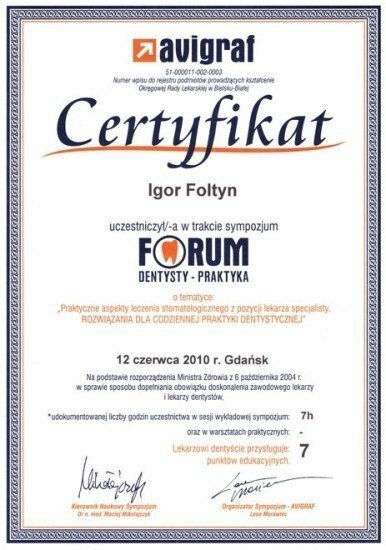 Our clinic has been awarded the „International Accredited Clinic” status for compliance with the GCR International Standards of Dental Care and ISO 9001:2008 certification by DNV-GL healthcare (Det Norske Veritas – Germanischer Lloyd) for compliance with the highest standards of dentistry according to the ISO 9001:2008 Norm. 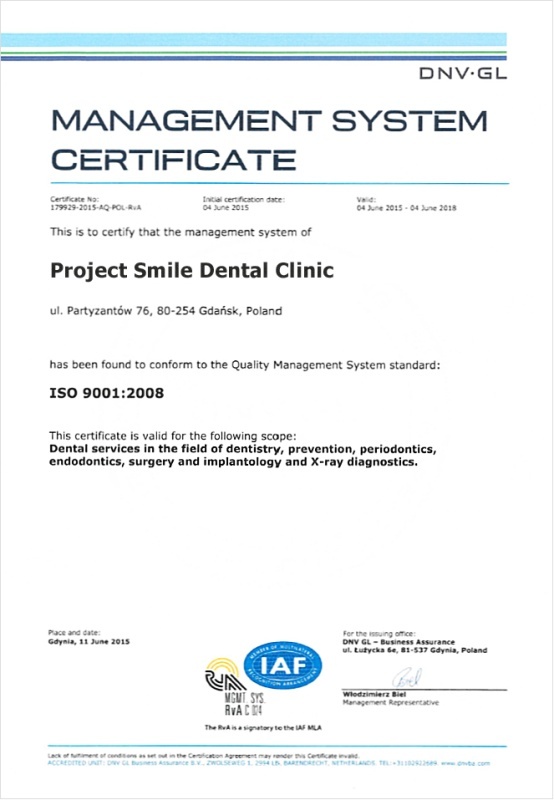 It is an internationally agreed standard for quality management systems ensuring that the infrastructure, work environment and dental team delivers the very high standards of treatment and care that patients expect. 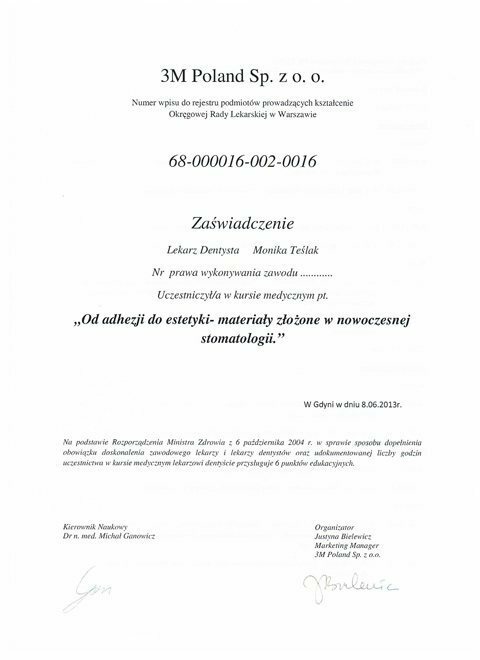 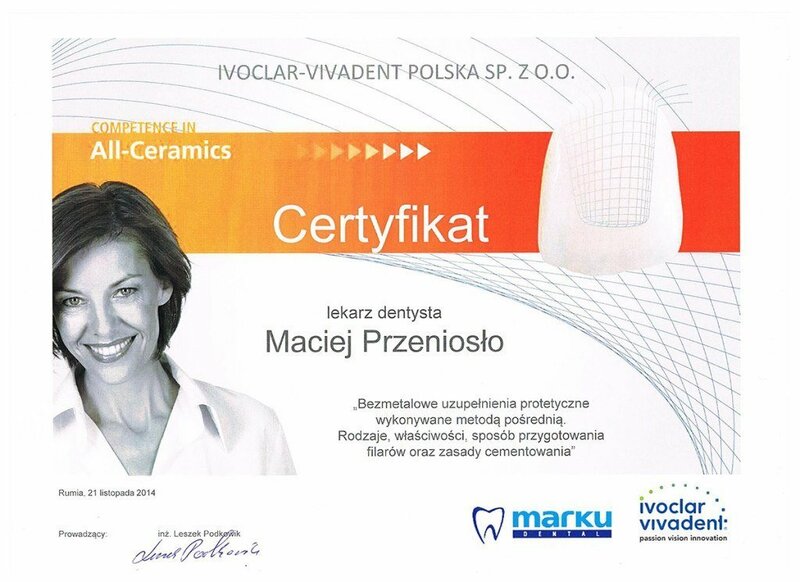 All our dentists are registered with the Polish Chamber of Physicians and Dentists (NIL), a member of the Council of European Dentists (CED). 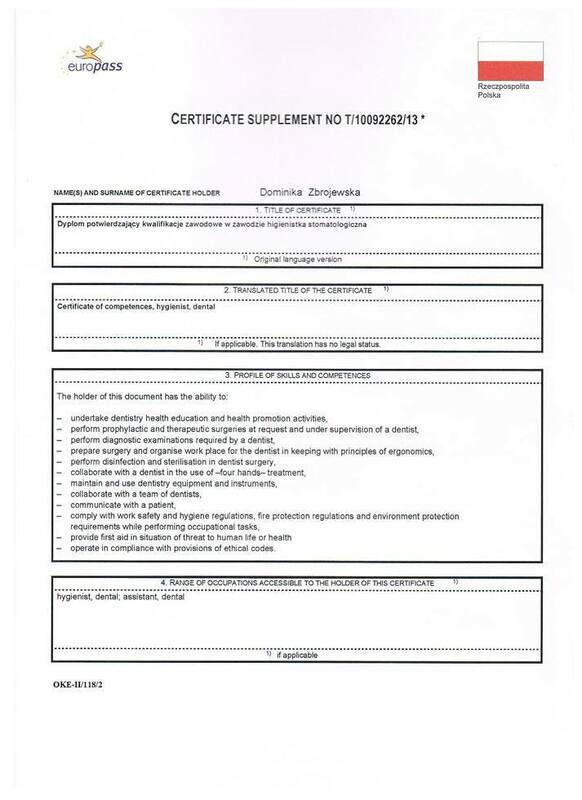 This is required of Poland, to ensure that quality and used techniques are the same as in any other EU country, since Poland joined the EU in 2004 and the Polish Chamber of Physicians and Dentists became a member of the Council of European Dentists. 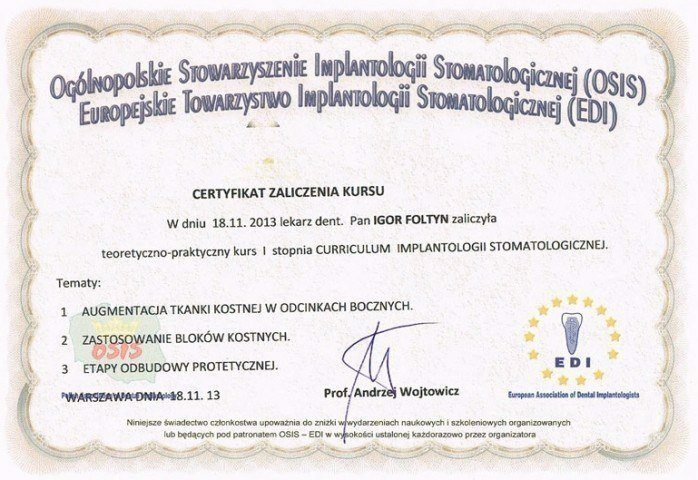 Specializes in: implantology, dental surgery and prosthodontics. 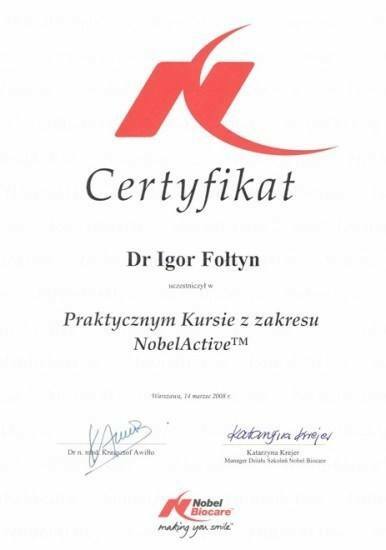 Dr. Foltyn holds a Master’s graduate from the Gdansk Medical Academy, and is a member of many prestige medical conferences, courses and seminars in Poland and around the world. 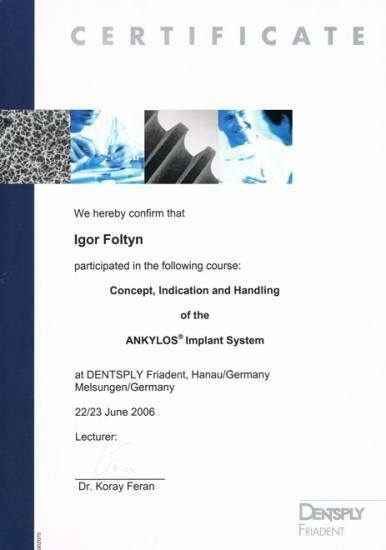 Through several years of practice and experience, Dr. Foltyn carries a vast range of professional skills in implanting, prosthetics and aesthetic stomatology. 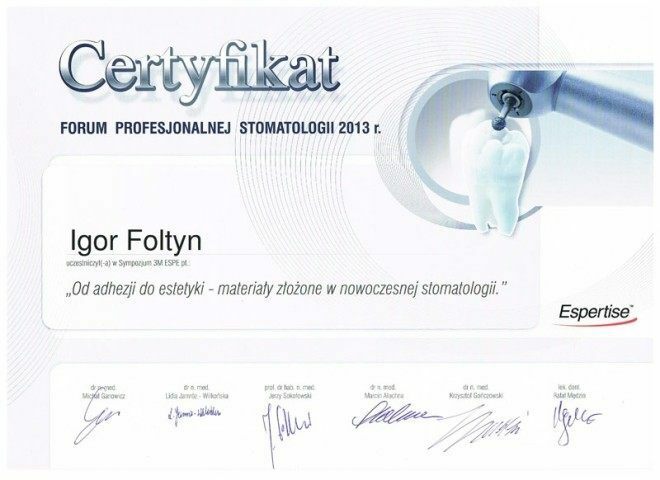 While providing high quality practices, Dr. Foltyn continually strives to gain further education and qualifications in his medical career to offer most advanced and innovative medicine and stomatology for the betterment of his patients. 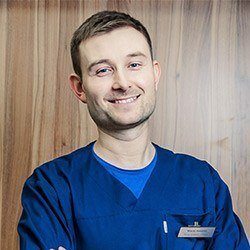 Privately, Dr. Foltyn shares his passion in both, winter and water sports. 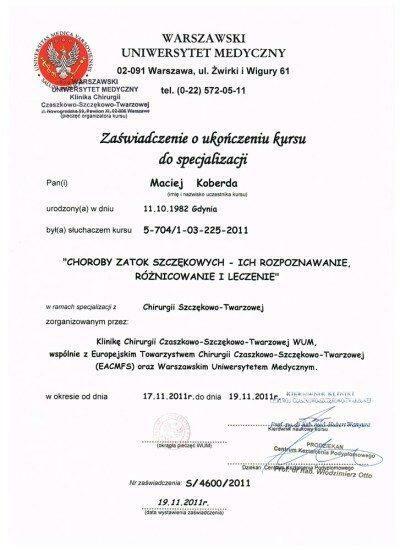 in the past he represented Poland in judo, accomplishing a medalist title. 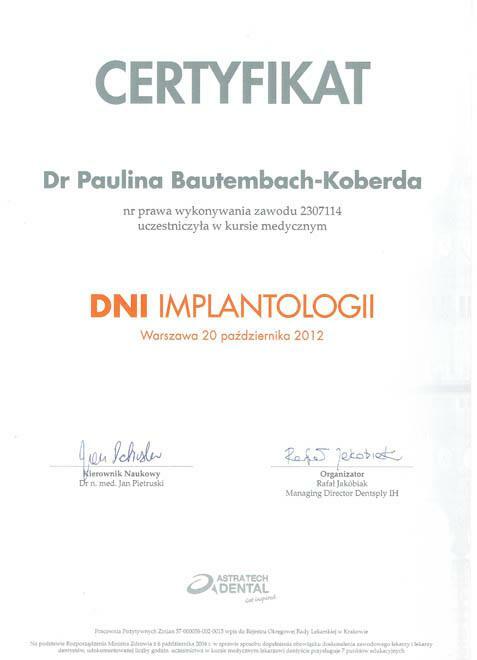 Specializes in: oral & maxillofacial surgery, implantology and prosthodontics. 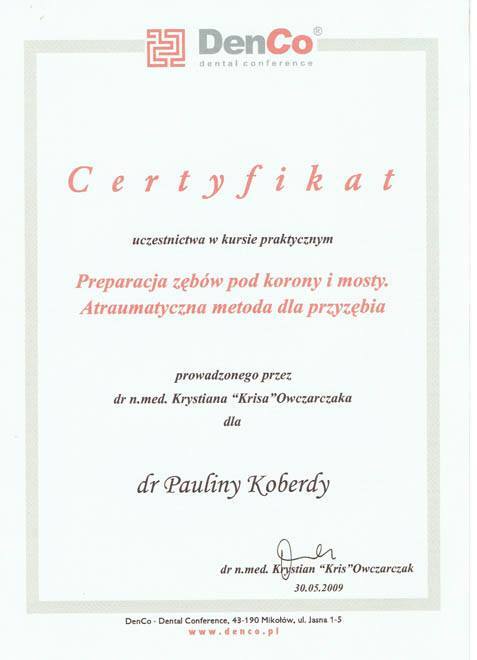 Dr. Koberda graduated from the Medical University of Gdańsk majoring in the Medical and Dental specialization, as well as, the Erasmus/Socrates Comenius University of Bratislava. 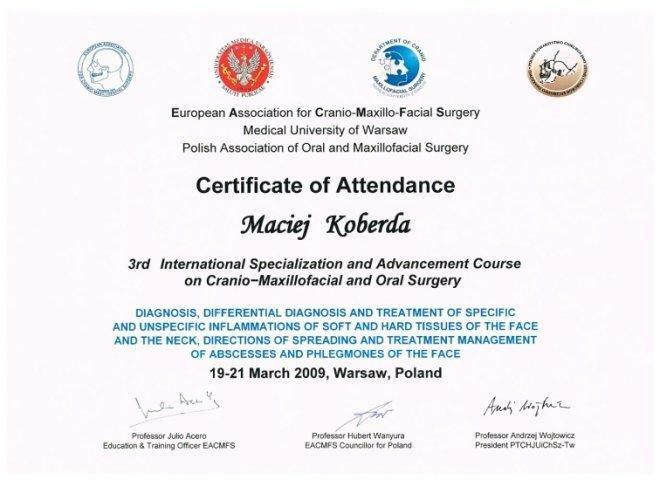 He is an author and co-author of several works in the field of jaw surgery and dental prosthetics. 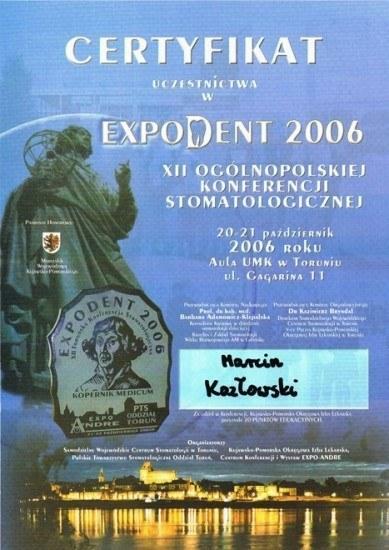 Dr. Koberda is a speaker on the subject of oral surgery. 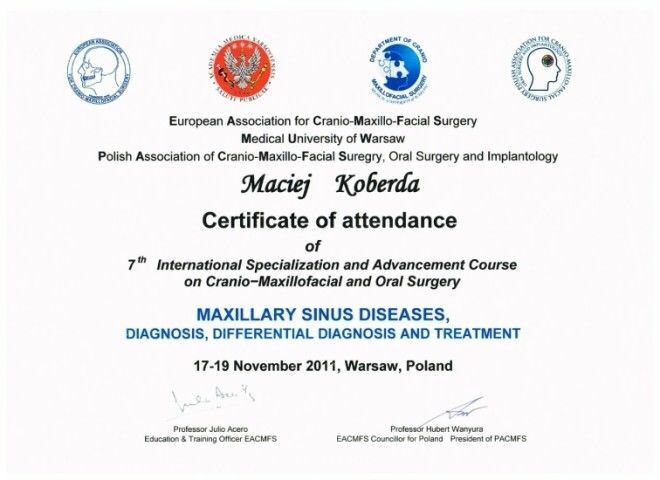 He works part-time in the Department of Maxillofacial (Oral) Surgery of Gdansk Medical University and is currently completing a specialization in Jaw and Oral Surgery. 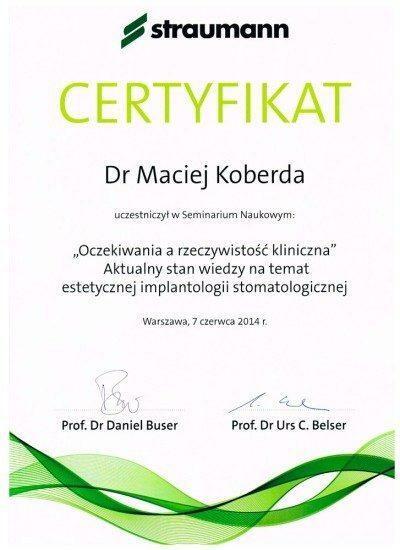 Dr. Koberda continues to raise his qualifications through many coureses focused on Jaw Surgery and Implantology. 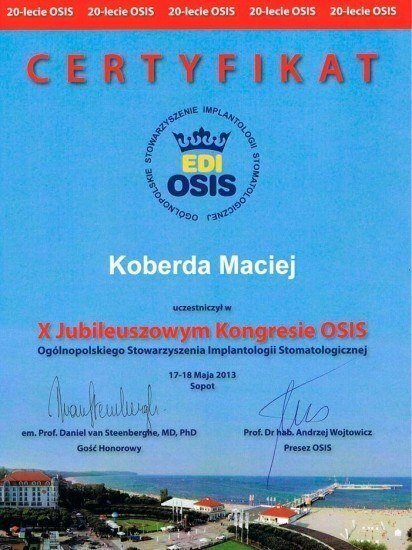 Dr. Koberda holds a Master’s graduate from the Gdansk Medical Academy and a graduate from the Erasmus/ Socrates Comenius University of Bratislava. 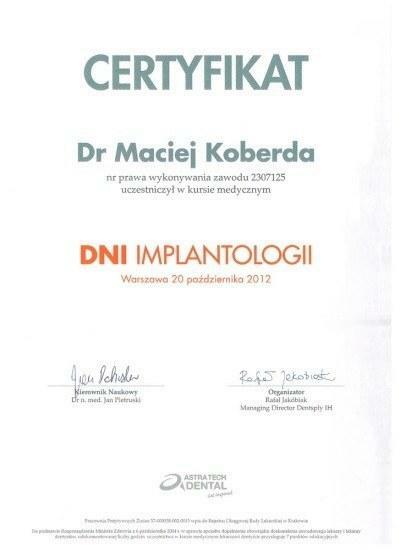 Dr. Koberda is awarded with a specialisation in Dental Prosthetics. 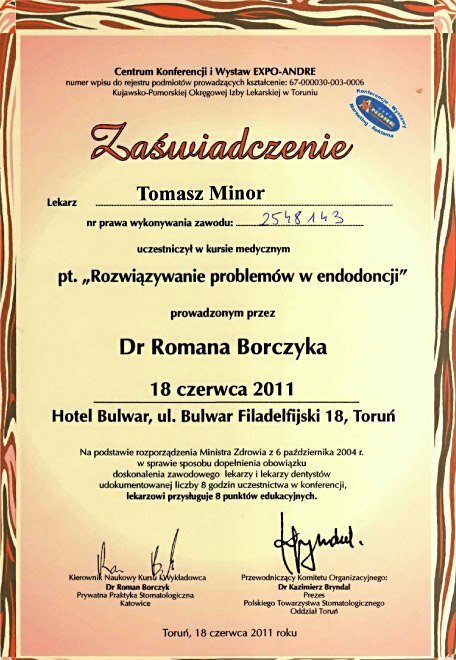 She is a member of many prestige medical conferences, courses and seminars in Poland and around the world. 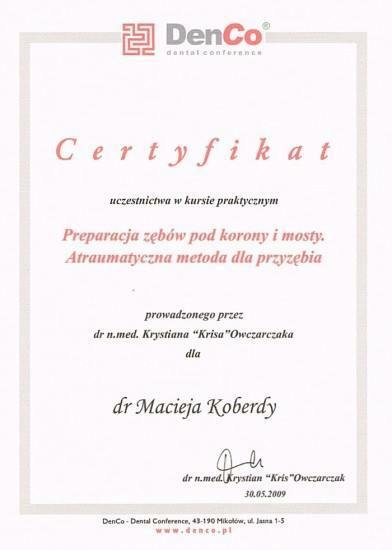 In 2013, Dr. Koberda received her PHD in medicine with high recognition during her PHD candidacy. 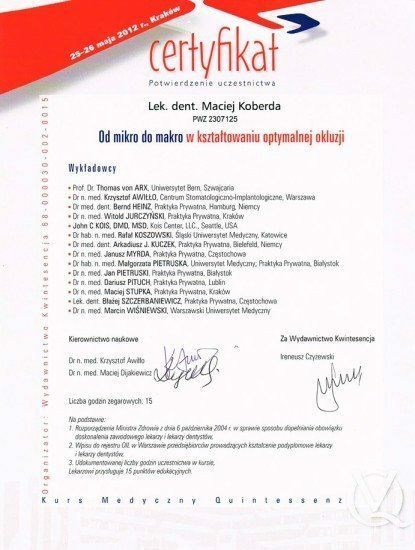 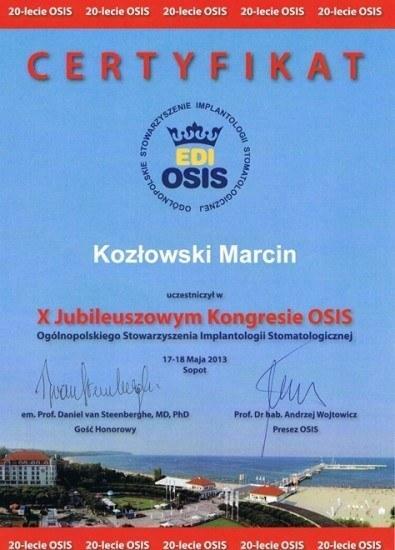 Being the author and co-author of many published works within the field of dental prosthetics and implantology, Dr. Koberda continues to be a very key member of publishers within the medical society in Gdańsk. 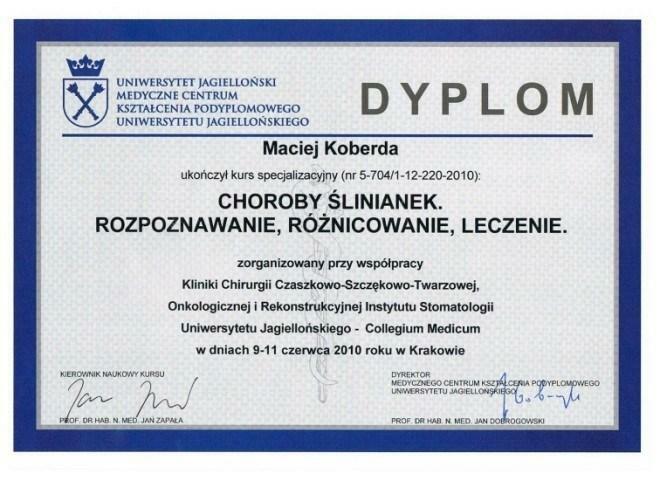 Since 2008, she is a staff member of the didactic-medical Cathedral or Prosthetic Stomatology in the Medical University of Gdańsk. 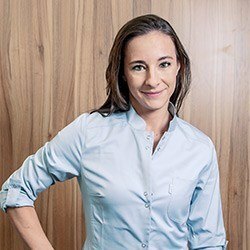 Dr. Koberda being most passionate about all new findings and the progress of her medical field, continually strives to gain further education and qualifications in her medical career to offer most advanced and innovative medicine and prosthetics treatments for her patients. 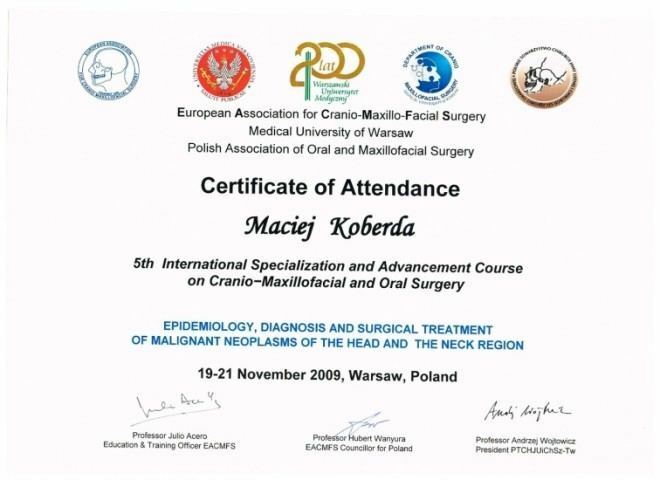 Koberda is highly respected and recognised for the ability to always think innovatively and progressively about each of her patient’s medical case. 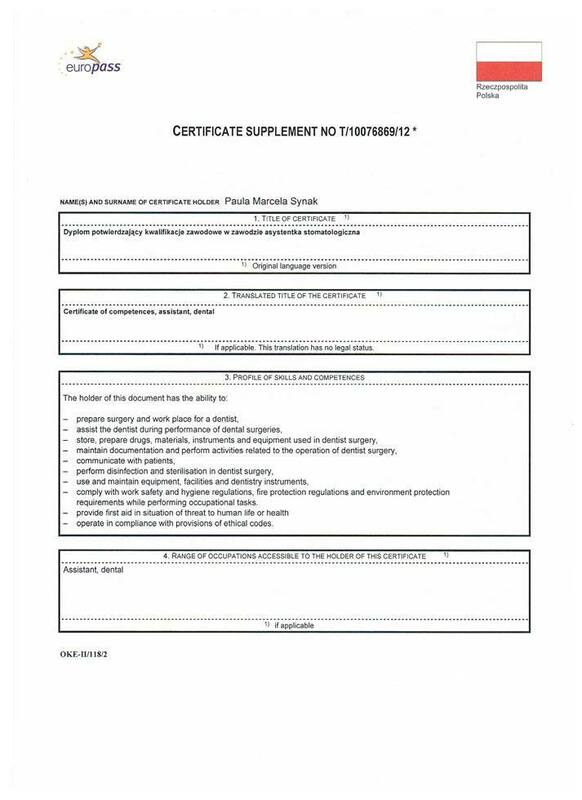 Her holistic approach guarantees her continual rise of medical success with patients. 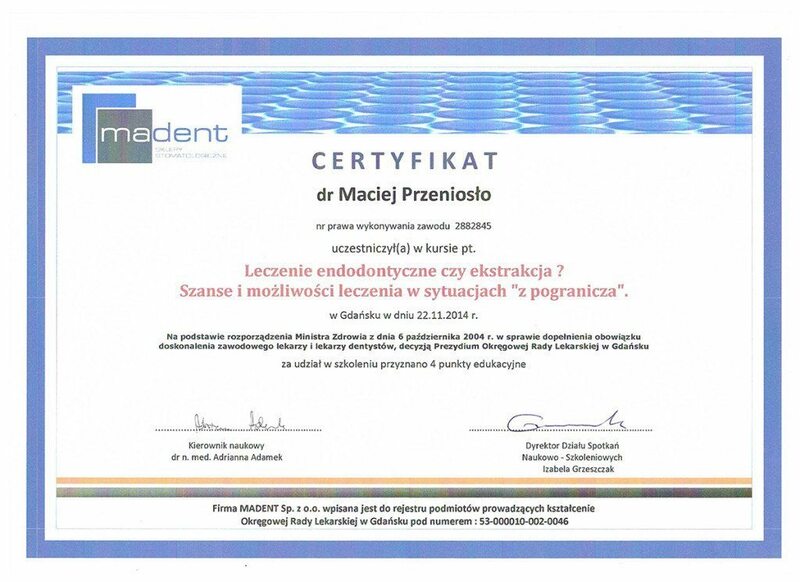 Specializes in: endodontics, conservative dentistry and prosthodontics. 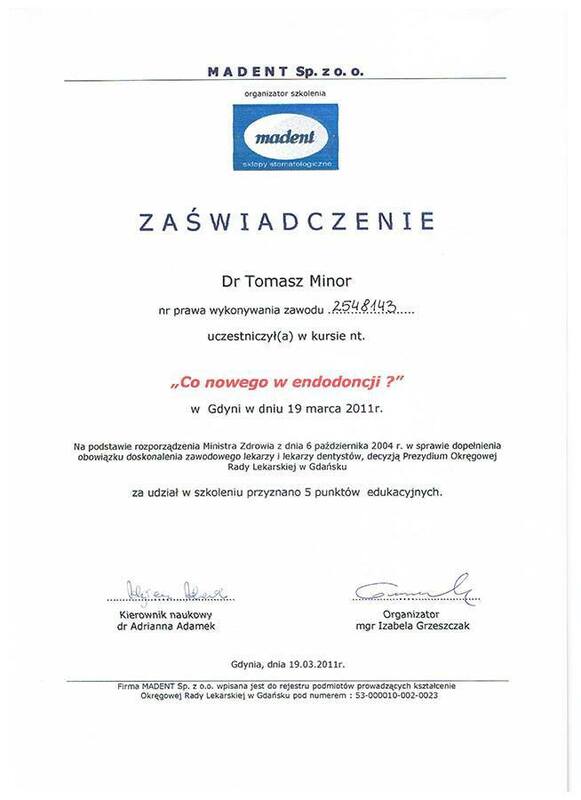 Dr. Minor is a graduate of the Gdańsk Medical University, where he completed his studies in dental medicine. He actively takes part in many dental conferences, courses and trainings that specialize in the knowledge of modern dentistry. 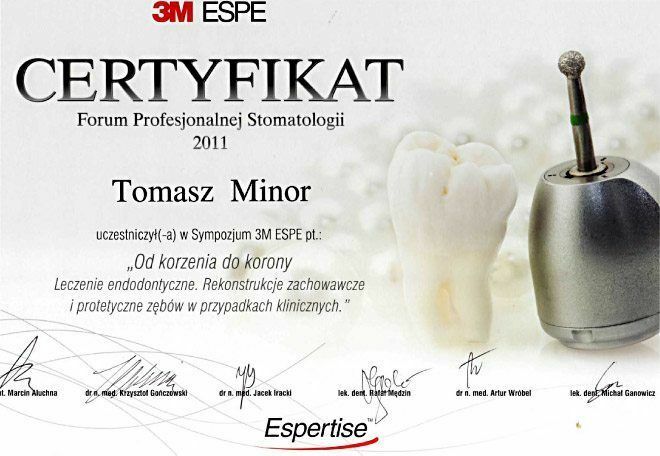 Dr. Minor is passionate about endodonic healing with the use of a dental microscope, also he continues to progress in modern dental prosthetics. 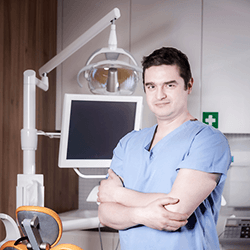 His main dental focus and work consits of esthetic dentistry, prosthetics, endodonics, dental surgery and general dentistry. 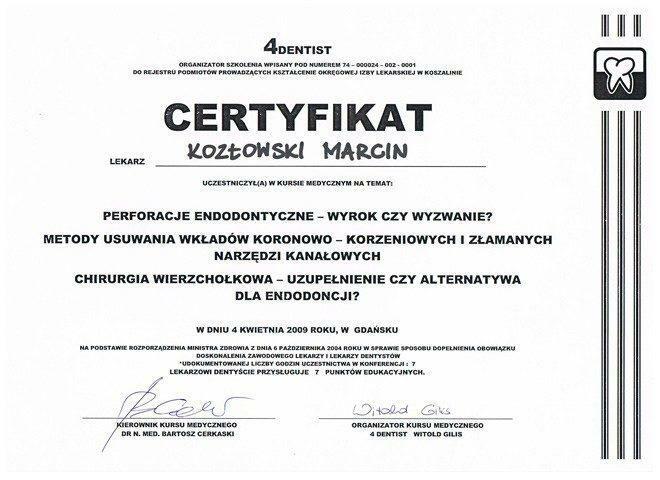 Specializes in: conservative dentistry, prosthodontics and endodontics. 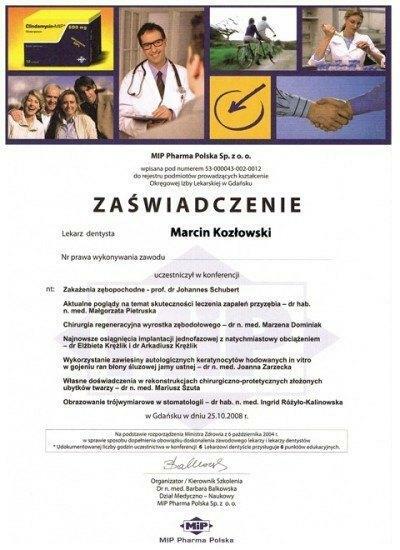 In 2001 he graduated from the Medical University in Gdańsk. 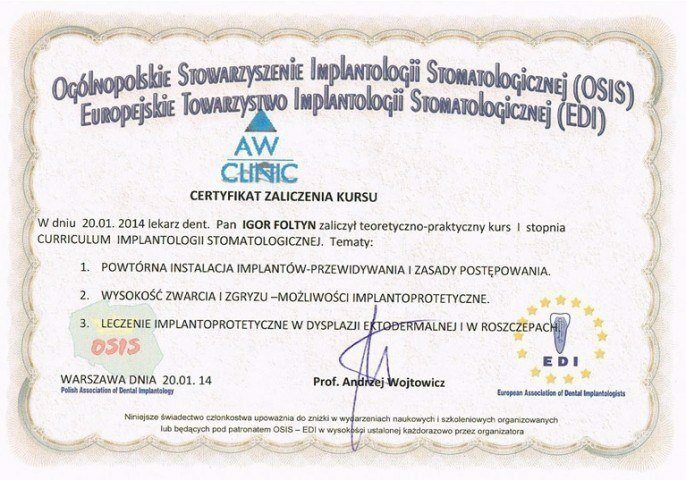 Dr. Kozłowski has many years of experience in dentistry, endodontics, prosthetics and dental surgery. 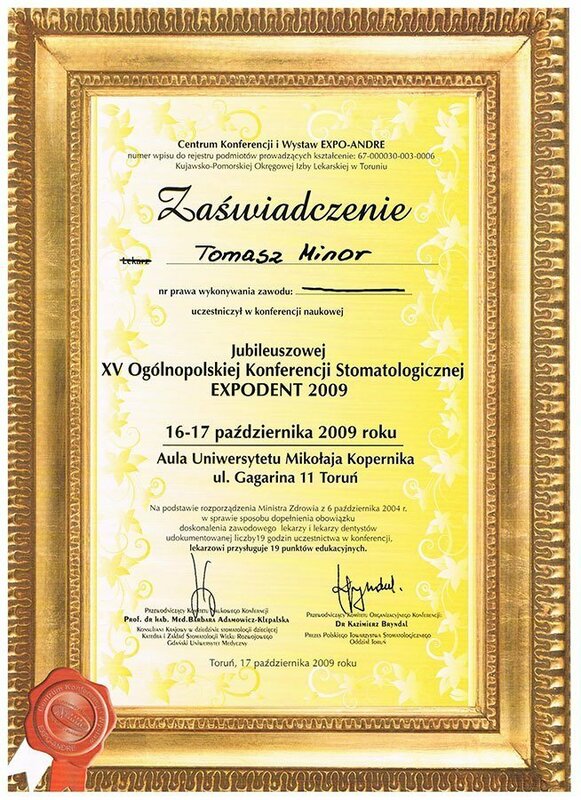 He cares for his on-going progress and practical experience through raising his qualifications in many conferences and coureses. 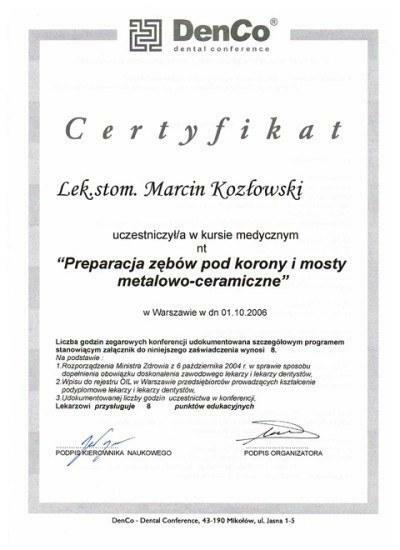 Dr. Kozłowski is unique in his ability to help relax his patients through a remarkable sense of humor. 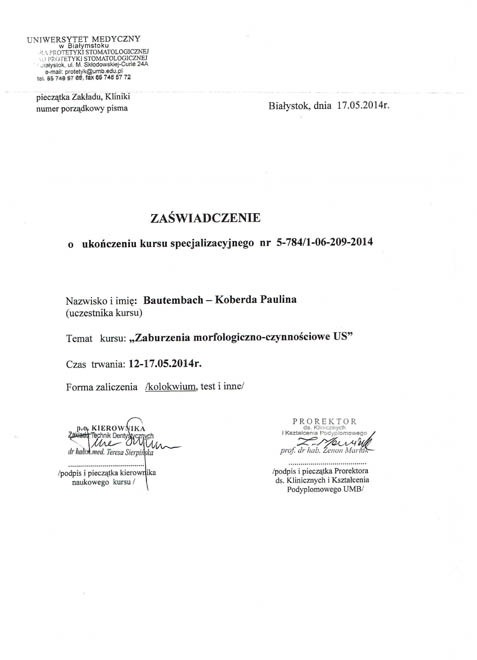 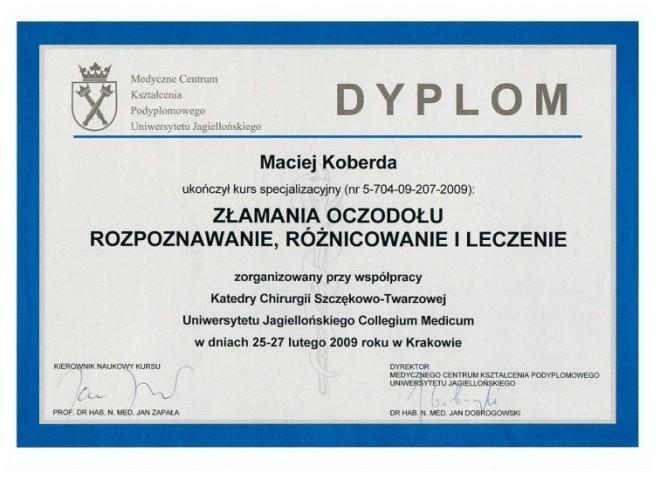 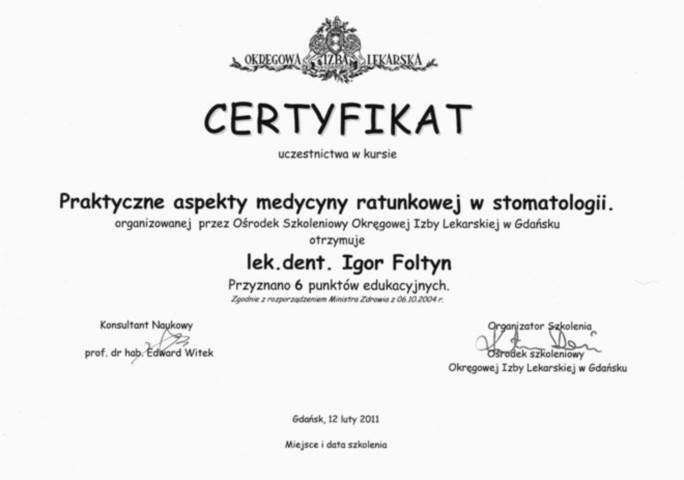 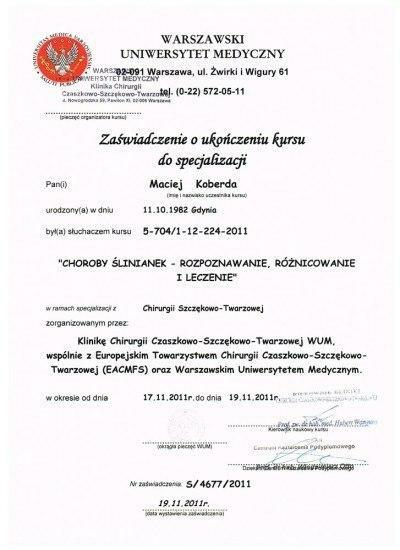 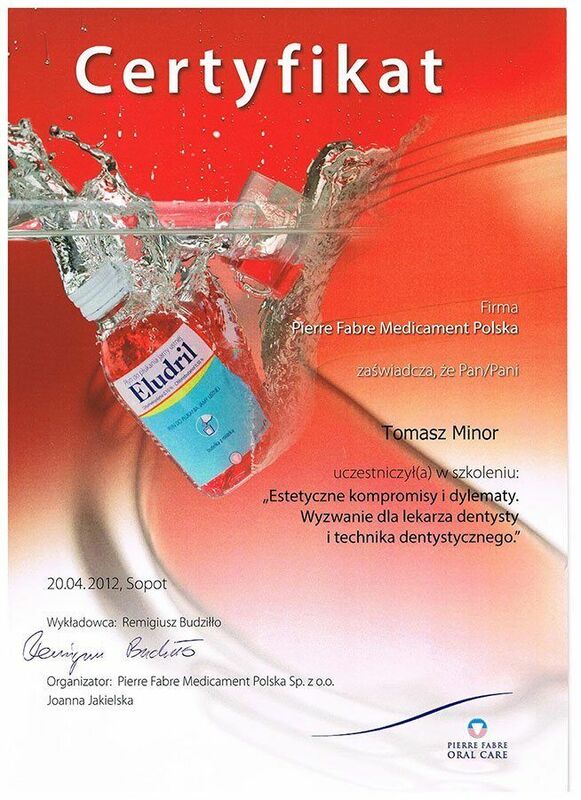 Graduated from the Medical University in Gdańśk with a major in Medical Dentistry. 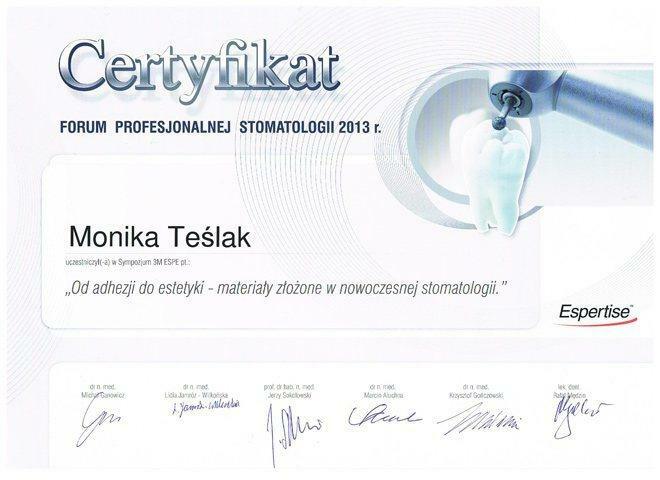 Dr. Teślak is very active in completing many coureses and minor trainings, which help her raise her qualifications in dental esthetics, endodonics and prosthetics. 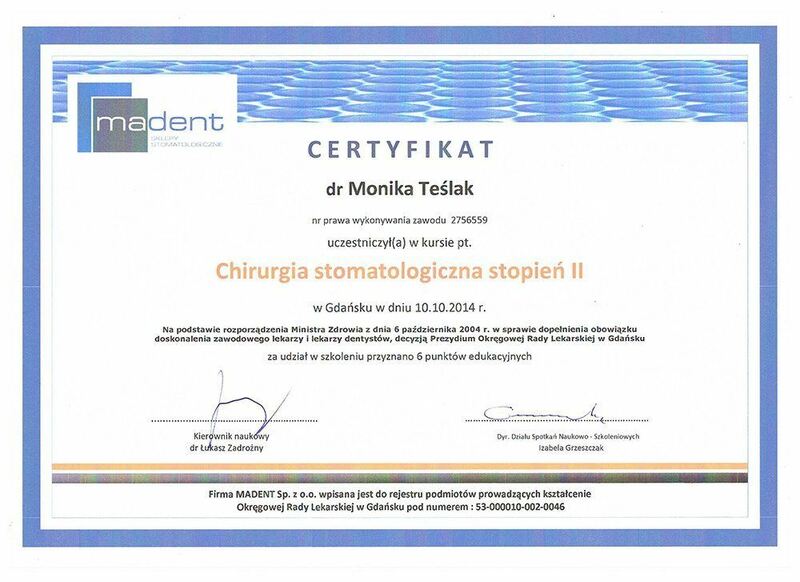 At our dental clinic, Dr. Teślak takes it as her duty to help patients overcome their biggest fears of the dentist. 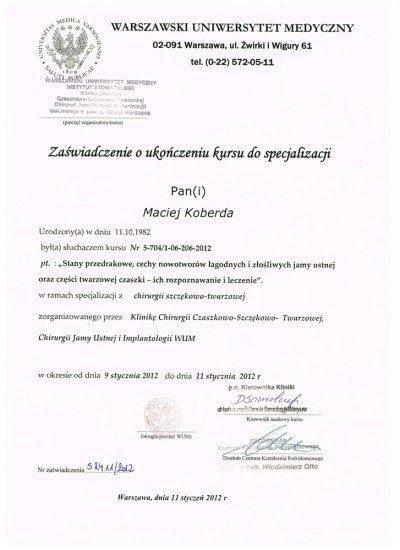 She took part in a prestigious exchange program Ondokuz Mayis Universitesi in Turkey, where she learned the neweset, most advanced techniques in dentistry, as well as the amazing culture of the country. 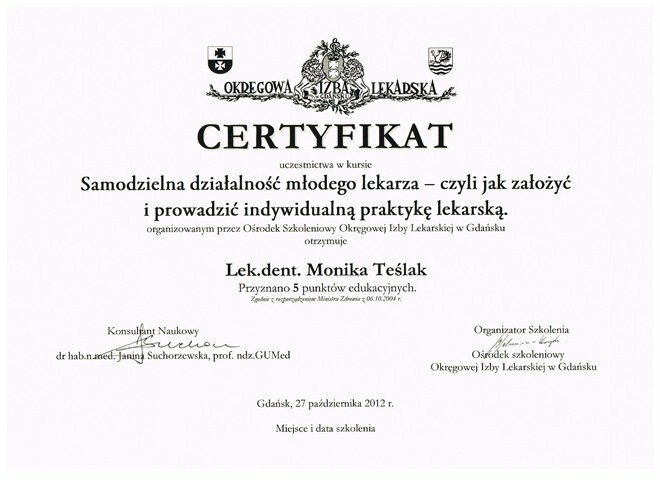 In her free time, Dr. Teślak loves motorbikes and far away traveling with her small camper back pack. 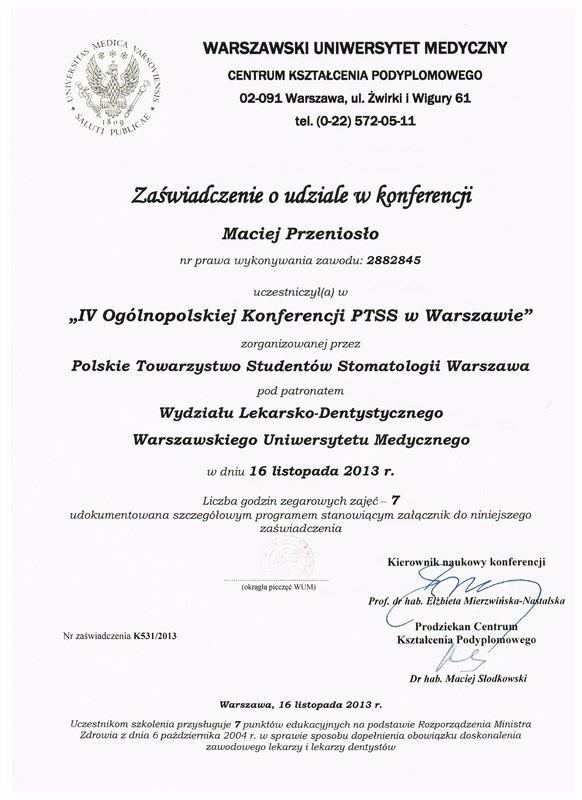 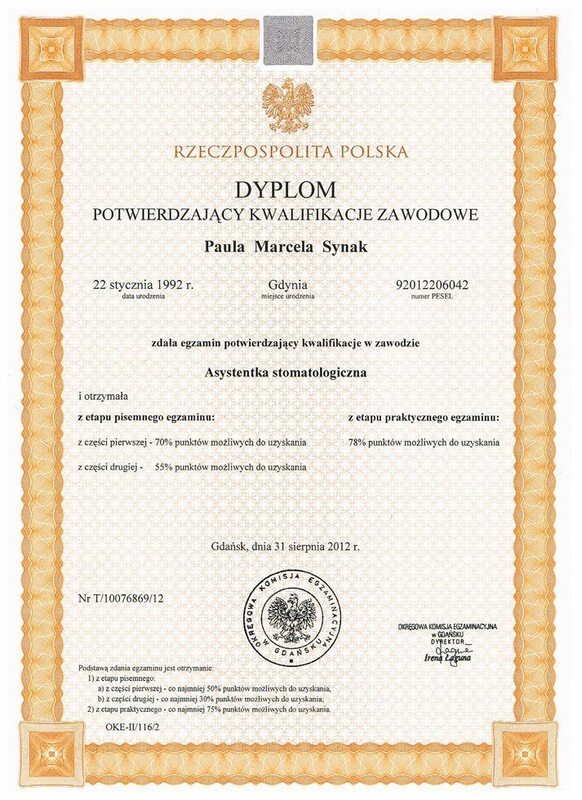 A graduate of the medical-dentistry program from the Gdańsk Medical University and a distinguished member of the Polish Student Society of Dentistry in Gdańsk. 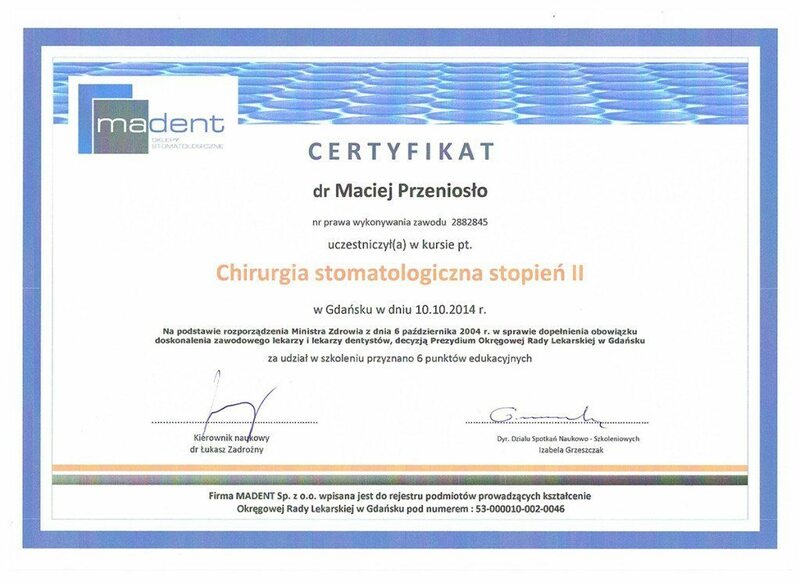 Maciek has perfected his knowledge and expertise at the Medical Society lead by the Dentistry GUMed Establishment, as well as, during several medical conferences across the entire country. 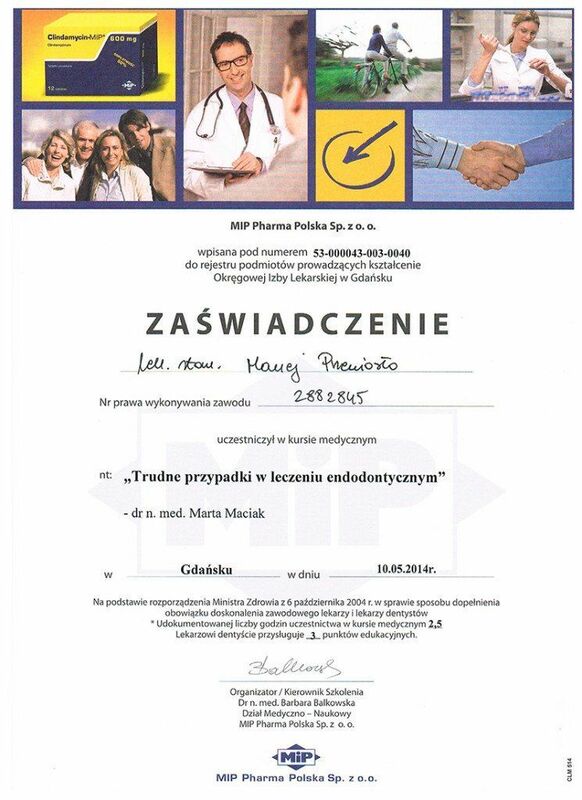 Every day, Maciek strives for improving his skills and expertise for the betterment of his medical service provided for his patients. 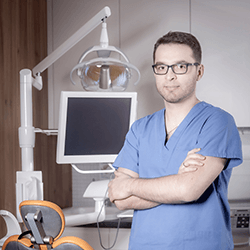 His professionalism and vast expertise allows him to bring forth the best medical service along with a beautiful white smile. 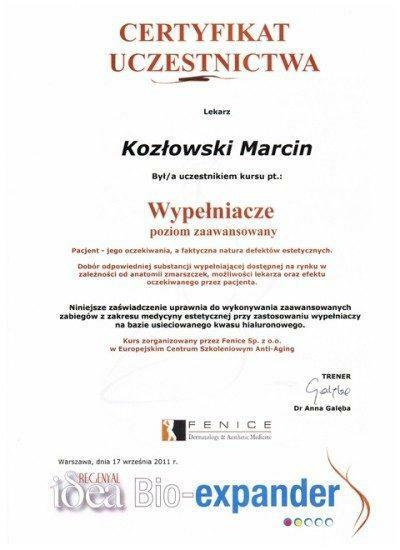 When it comes to his free time, Maciek is most passionate about sailing and being captain at sea. 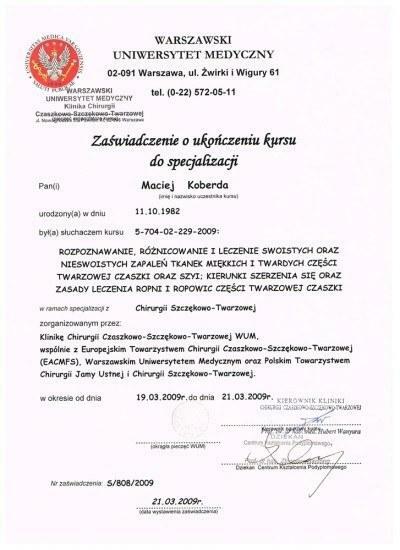 He also enjoys being an instructor and lecturer in various institutions concentrating on his day to day profession. 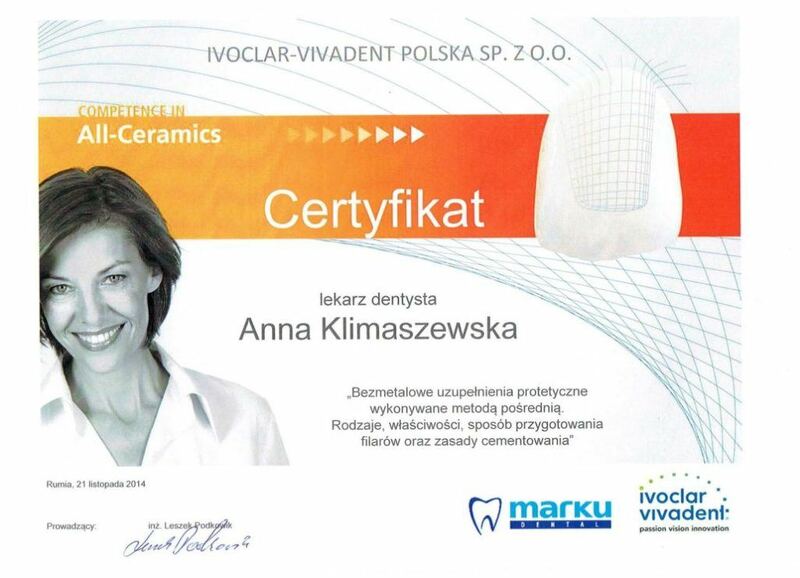 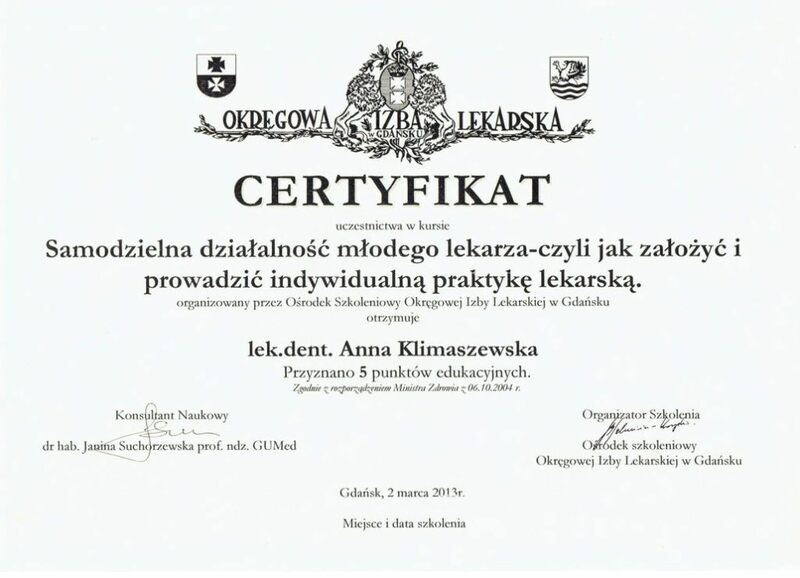 Anna is a graduate of the Medical University of Gdańsk with a specialization degree in Dental Medicine. 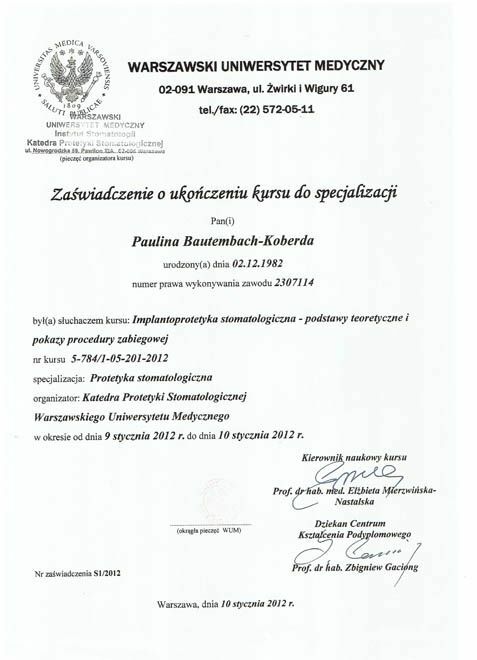 During her time outside of work, she teaches and lectures at the Prosthodontics Center within the Medical University of Gdańsk. 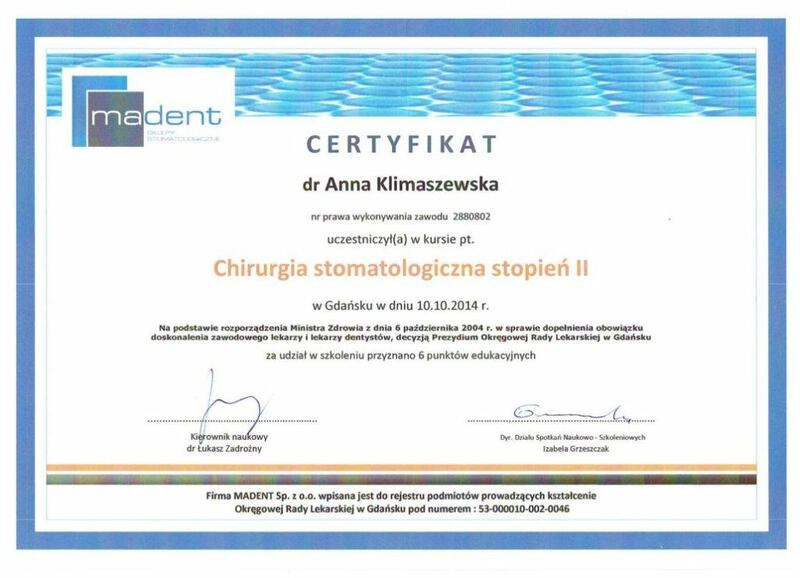 Anna systematically ehances her knowledge and rapidly gains theoretical as well as practical experience within the fields of Prosthodontics, Cosmetic Dentistry and Endodontics through several courses and trainings. 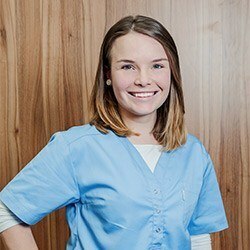 Her true passion is working on her ability and progressing her skills to further implement her knowledge into helping her patients with the best dental care possible! 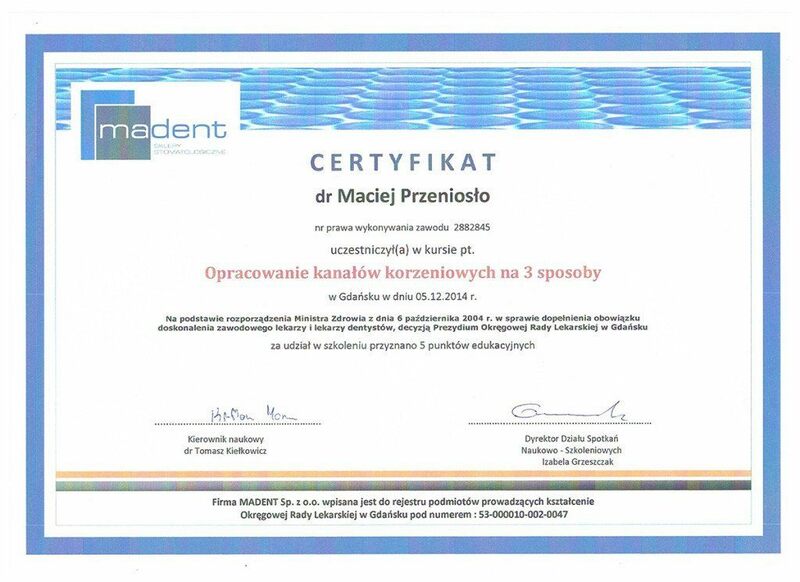 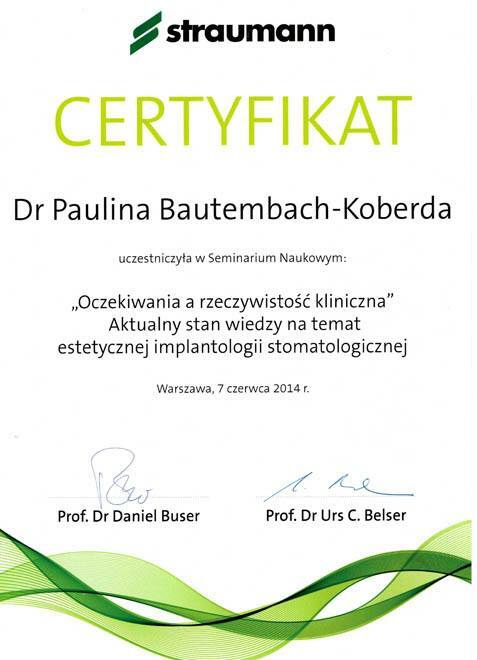 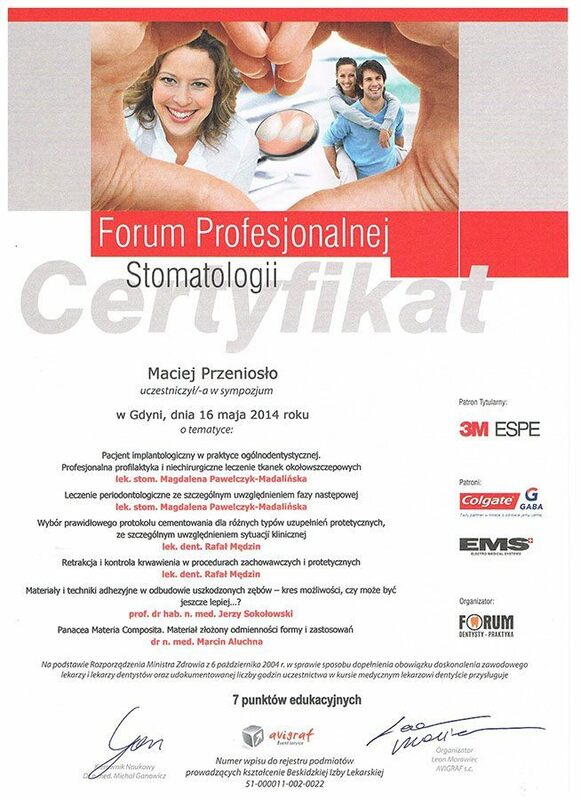 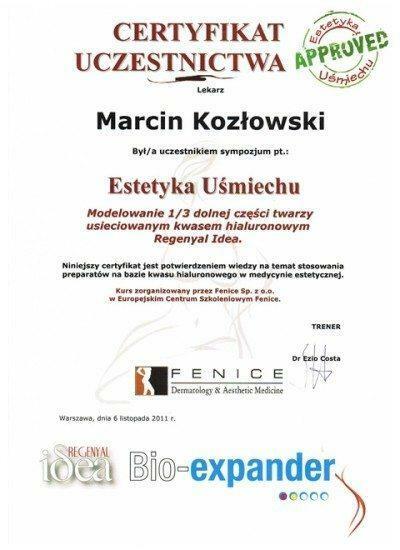 Graduated the Dental Hygen Study in Gdańsk, she continues to work in her majored field for many years now. 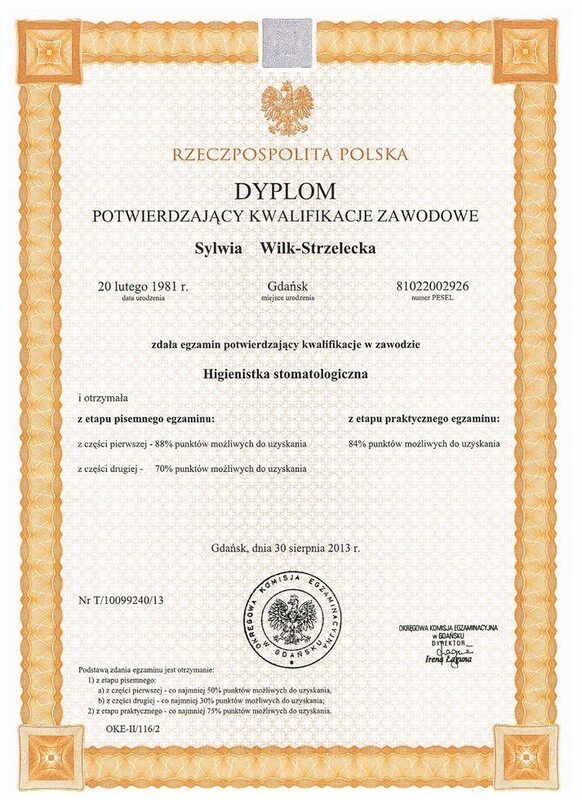 Syliwa continously attends many courses and trainings to keep improving her specialization. 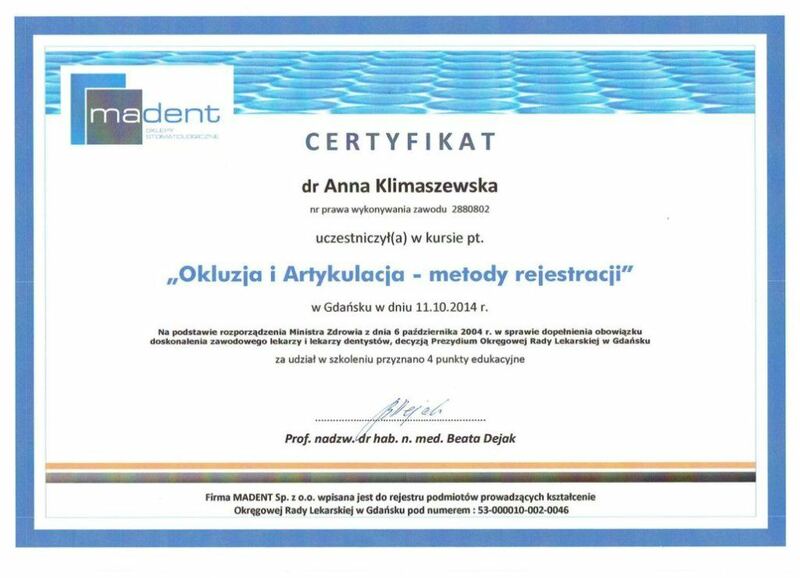 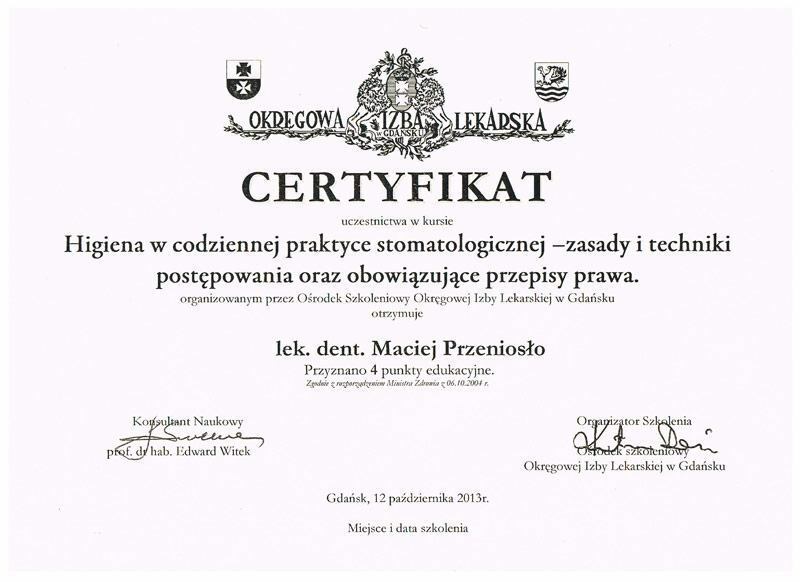 Dominika graduated from the Gdańsk Dental Hygenist Study, where she continues to work in her graduated specialization for several years now. 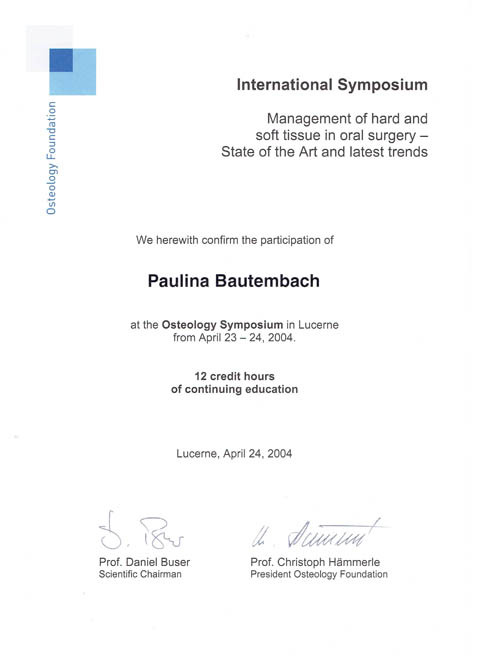 She consisntely raises her qualifications in Dental Hygen through several coureses and trainings. 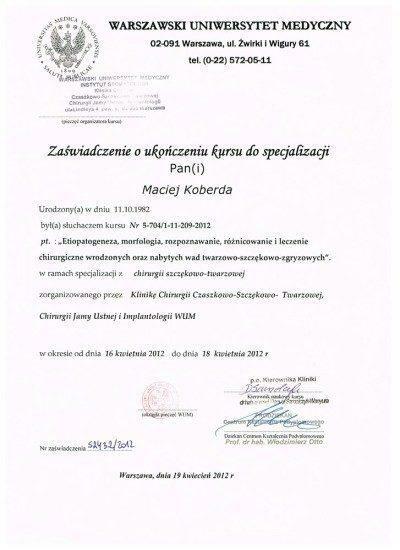 Her main interests are chemistry and biology. 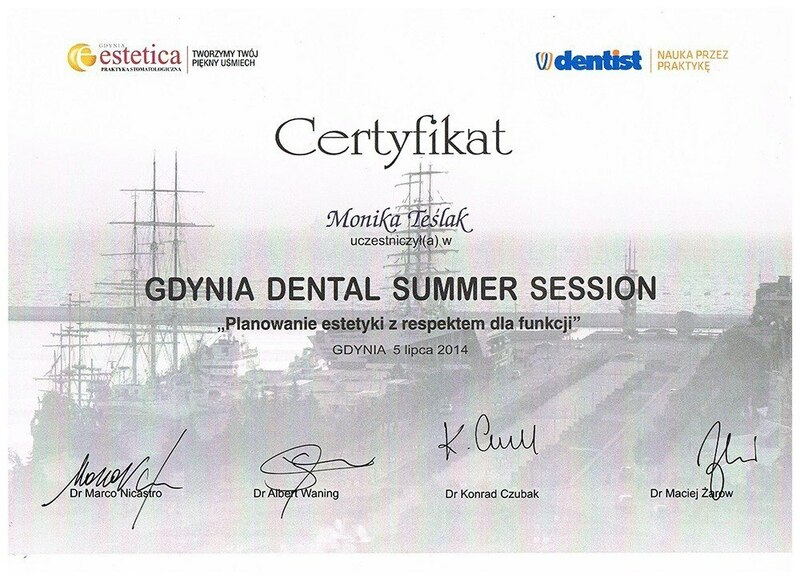 Currently she is a student of the Gdańsk Dental Hygen Study. 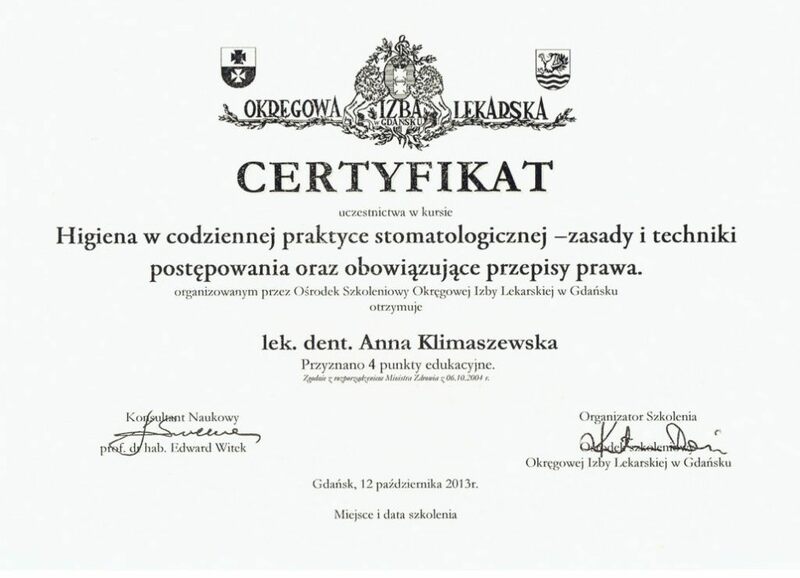 Ania consistently raises her qualifications through attending several coureses and practical training sessions specializing in her field of study. 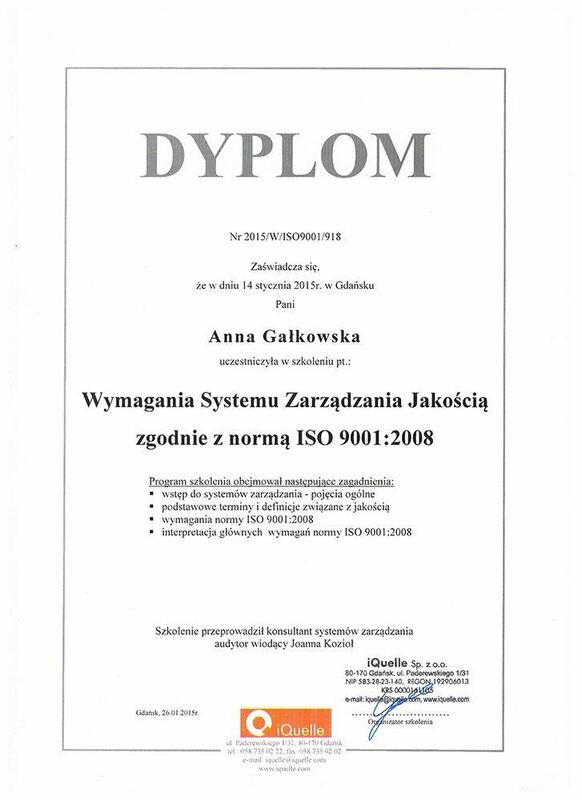 In her free time she enjoys to read books and play squash. 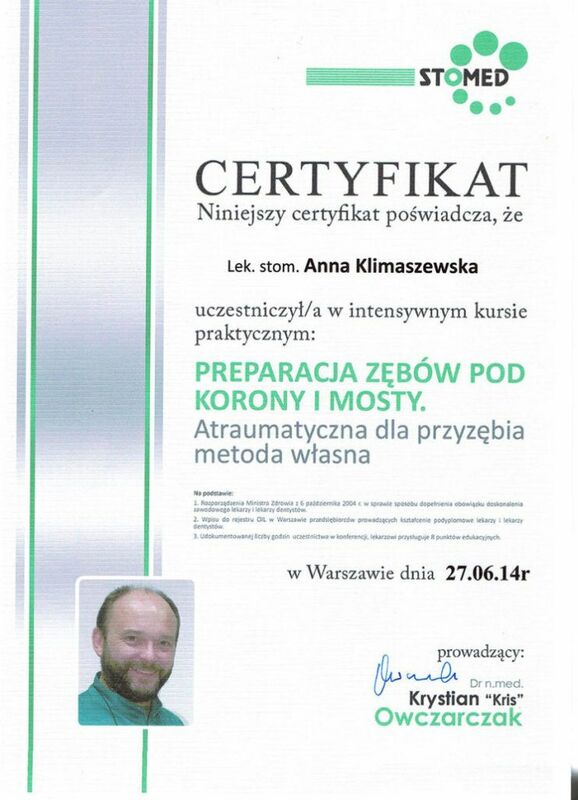 Ania is passionate about winter sports and she eagerly shares her snowboaring abilities by being an instructor. 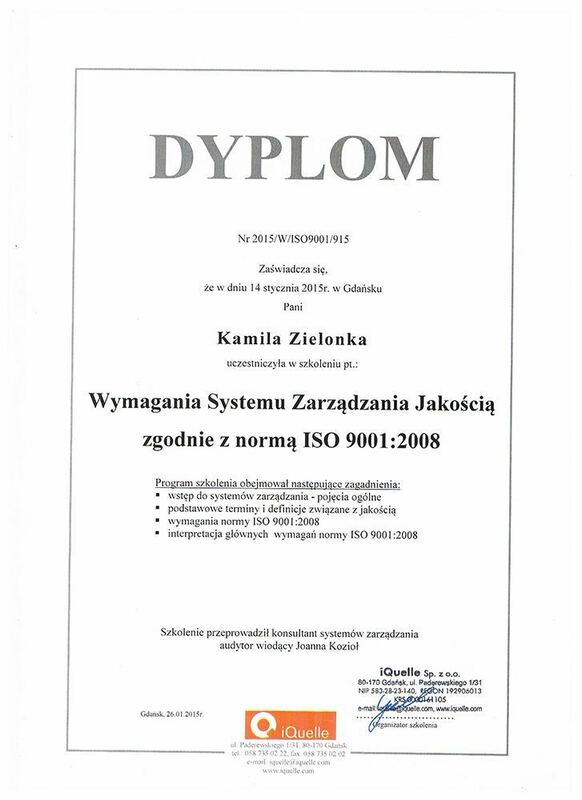 Kamila currently attends the Naval Academy where she completes her major in Social studies and education. 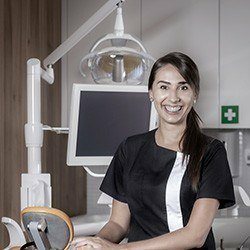 At our dental center, Kamila is responsible for the entire registration process, as well as for sharing all information about our dental services and directing patients to the right doctors accordingly. 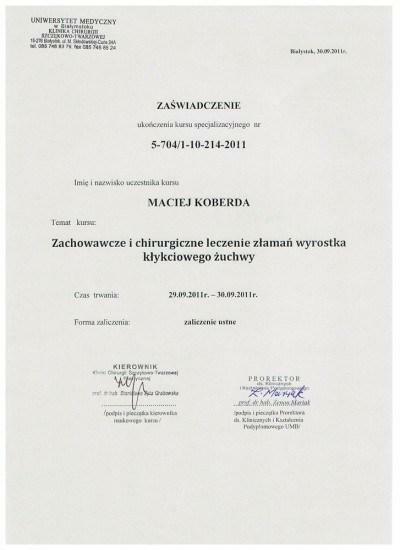 Mr. Szuchnicki is a graduate of both, the Land Engineering Politechnic of Gdansk and the University of Warsaw where he studied journalism. 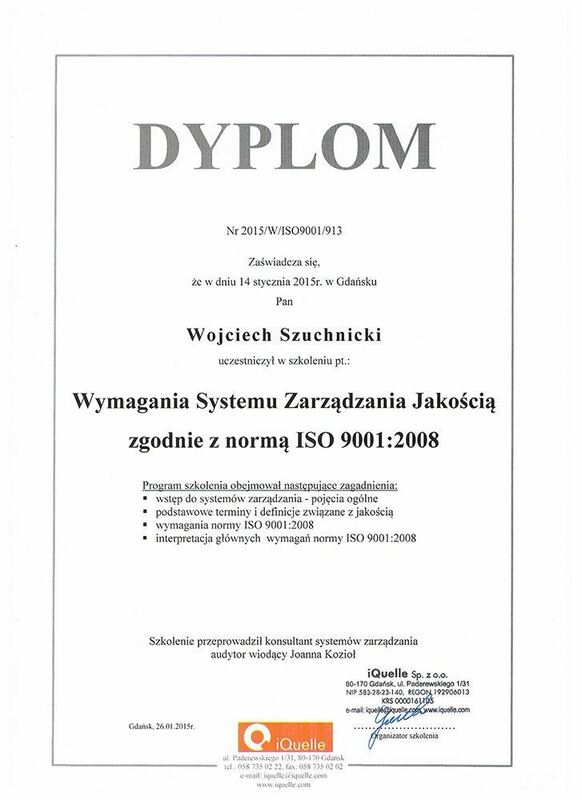 In recent years, Mr. Szuchnicki has very successfully co-operated and ran an architectural-construction company in Gdansk. 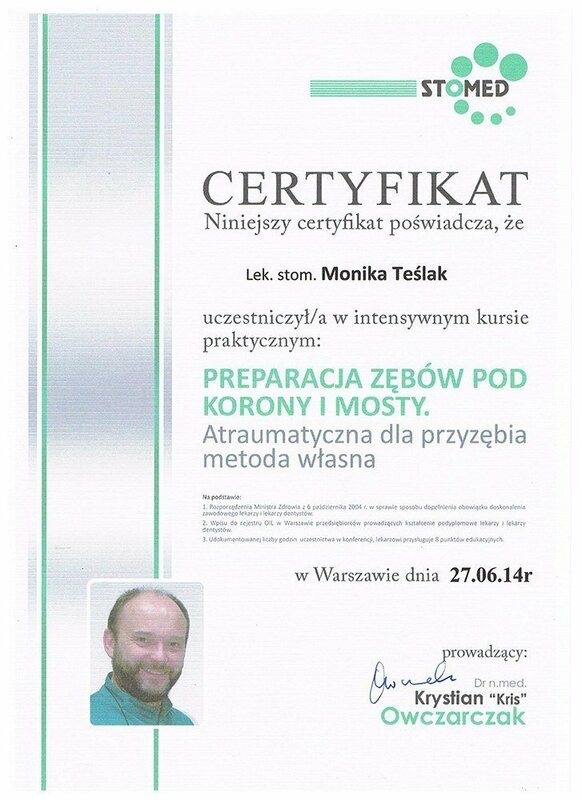 Being highly experienced in management and business operations, Mr. Szuchnicki developed a passion for entrepreneurship and business. 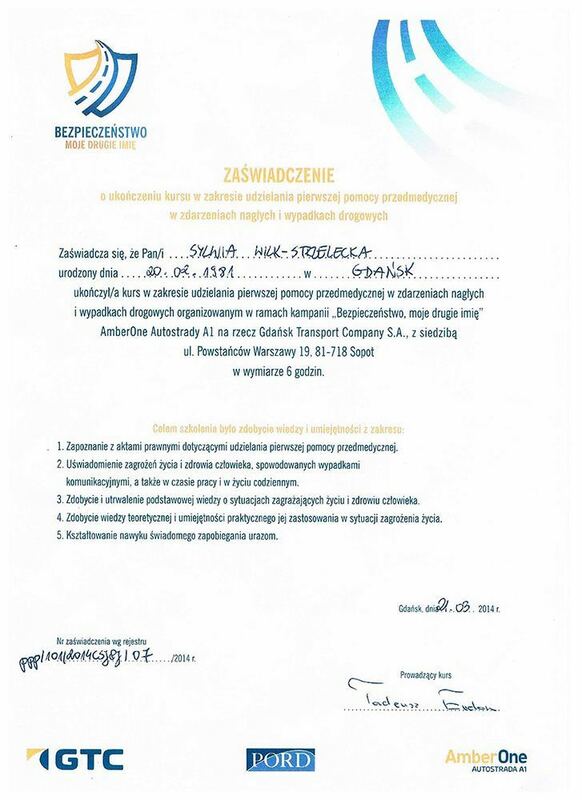 As a gifted and passionate athlete, Mr. Szuchnicki has been a professional fencer for 20 years, where he accomplished many times titles of varying degrees like: Champion of Poland, World Champion medalist and European Champion medalist. 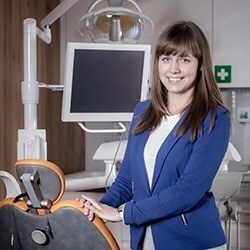 Attach a few close-up photographs of the concerned teeth or X-ray image or treatment plan from your local dentist. How likely are you to recommend our service to friends and family? 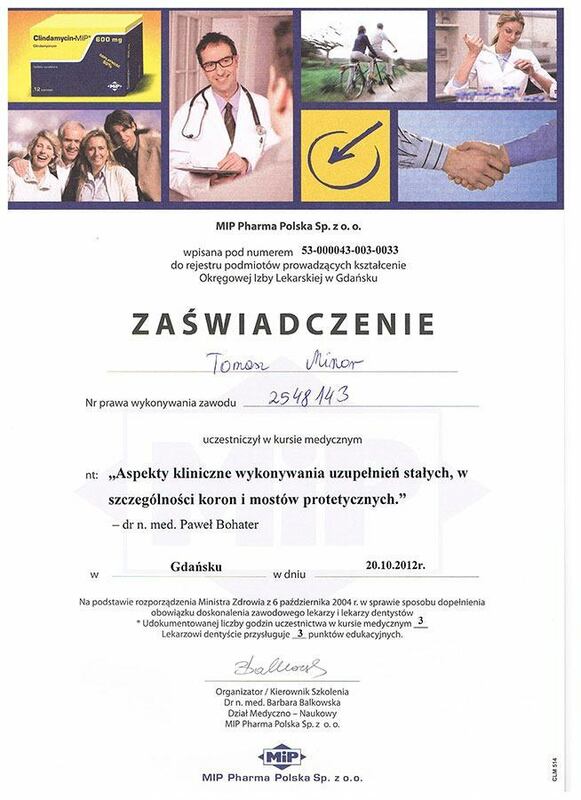 After choosing project smile, I was very happy with the plan of action and updodate and professional feedback provided by the team. 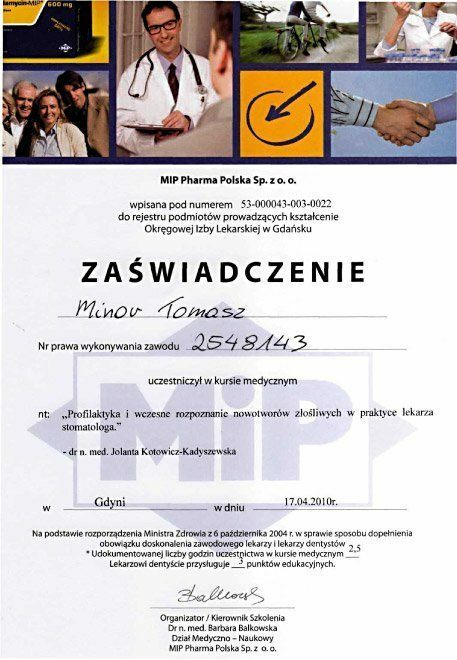 I had quite extensive work carried out, and visited the surgery on numerous occasions, however being in the friendly capable care of team provided the reassurance needed. 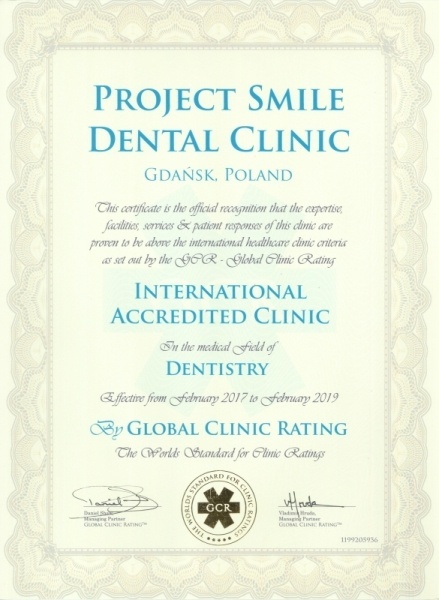 I am more than happy to recommend project smile dental clinic. 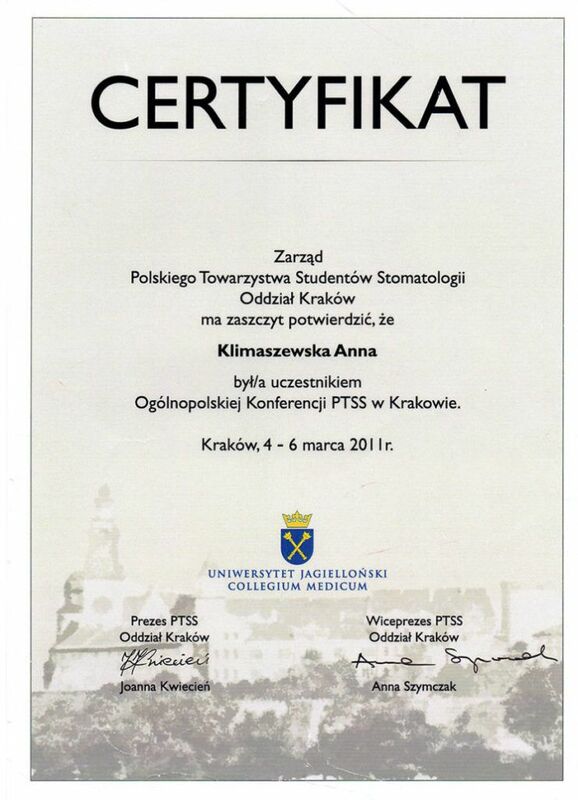 My experience was amazing. 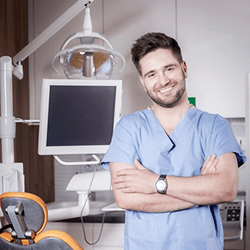 Dental professionals who truly care. 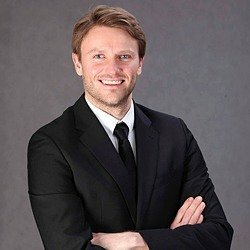 I originally asked for a quote based on a US based team. 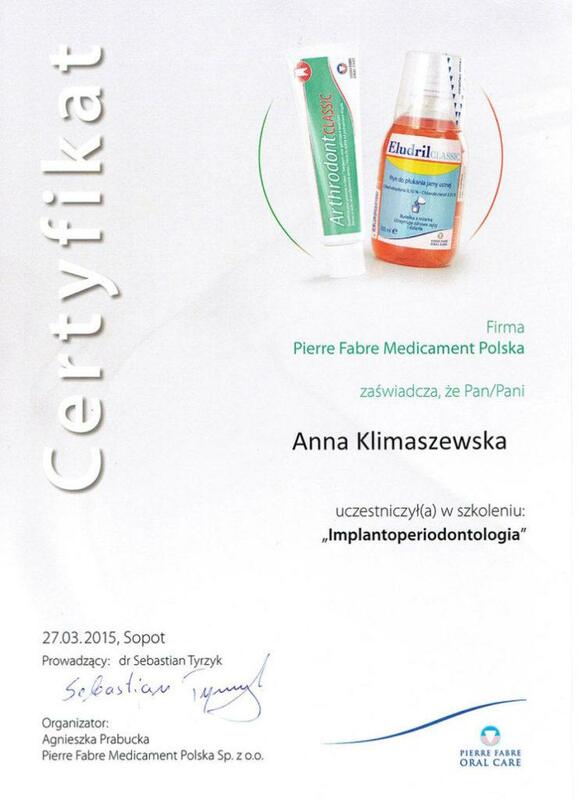 The dental surgeon from Poland called and explained to why that was not the healthiest solution in the long-term! I ended up with fewer implants because they saved more of my original teeth. 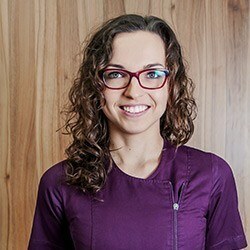 When it was all done, my neighbor said I looked ten years younger, my sister said I had such a beautiful smile, they hadn't seen it in such a long time. 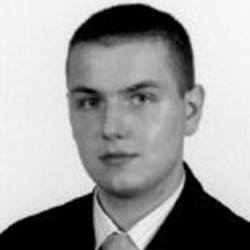 I do smile all the time now. 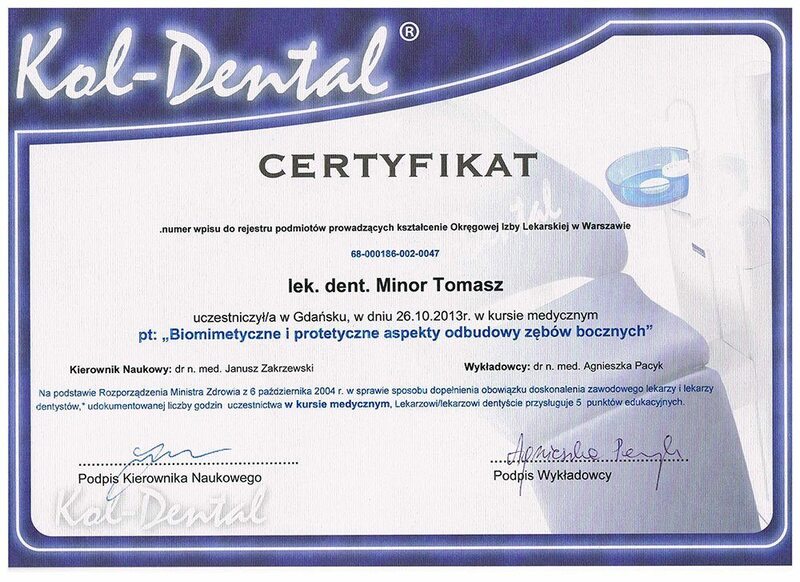 The dentists in Poland were always checking to ensure I was not in pain. 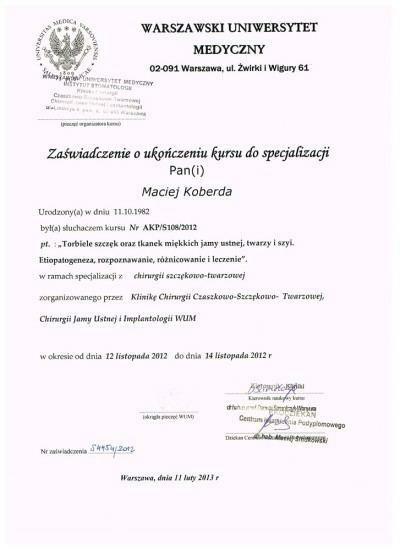 I never was. 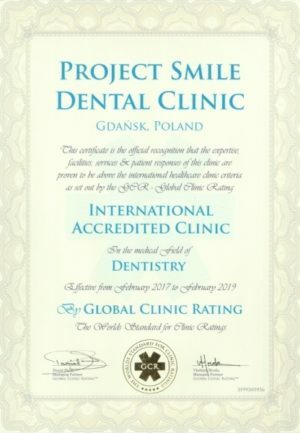 I have never been to a dentist as gentle and caring as Project Smile's. 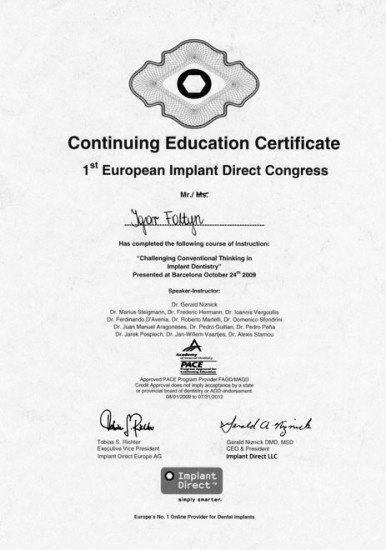 My brother in-law needed an implant. 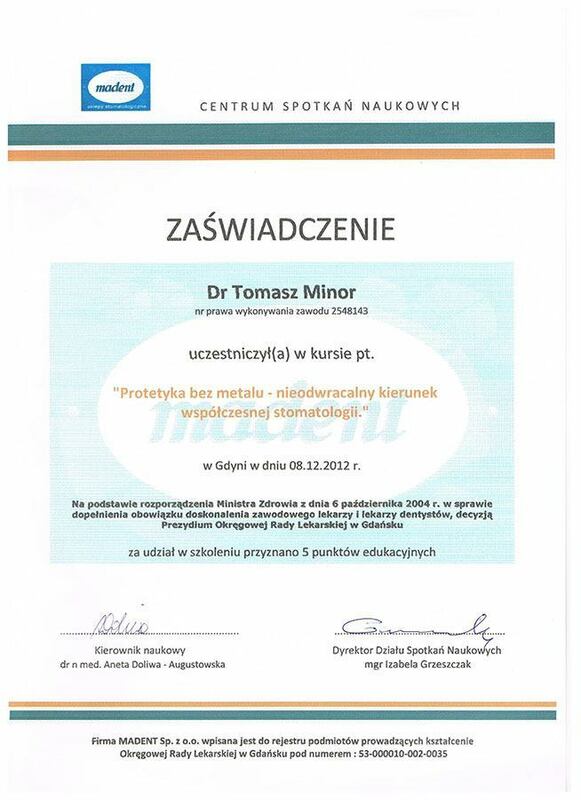 I told him to call Project Smile and take a vacation. 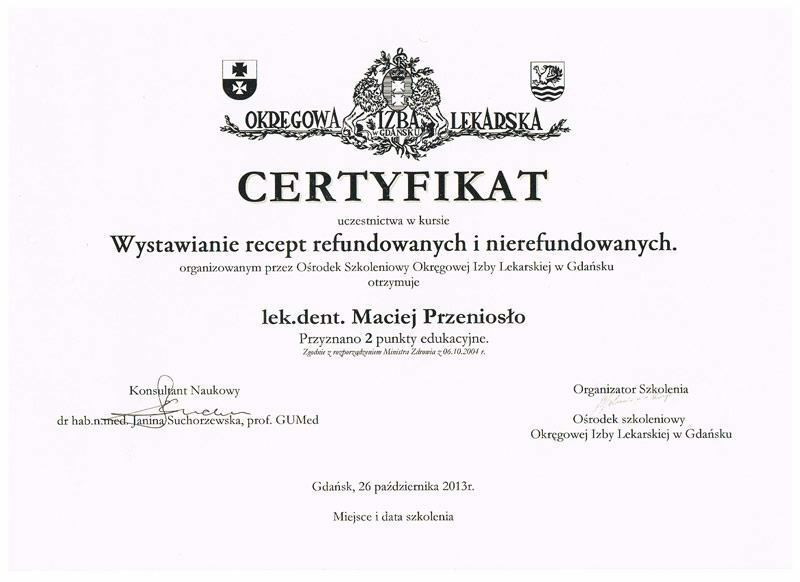 The cost would be about the same. 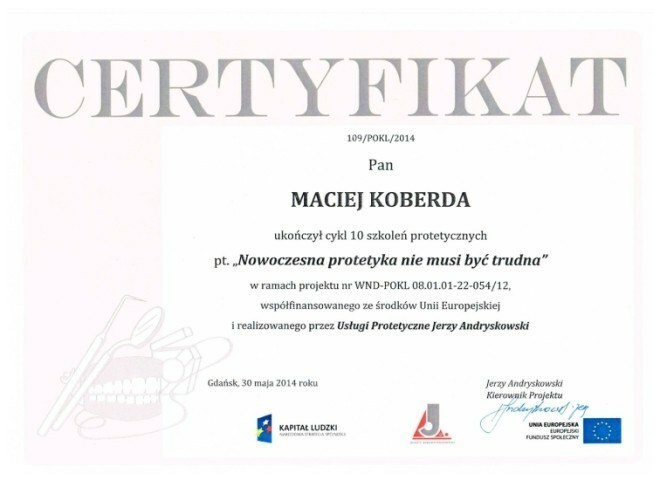 I was very pleased with the treatment that I received in my four visits to the Project Smile clinic. Mr. Patryk Becker, was very helpful and I was really thankfull for the help given in arranging transport and accommodation. 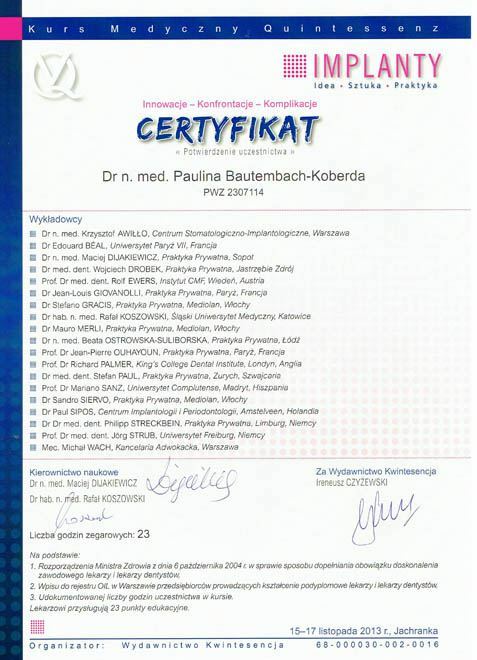 The doctors that attended me, where so very thougtful and polite, and and had really very high standard of professional skills. 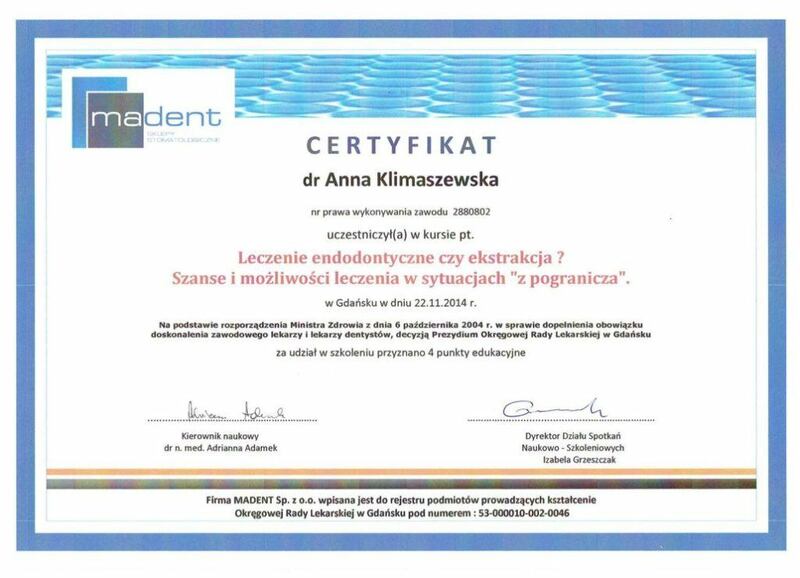 The cilinic is very modern and has latest dental technology. 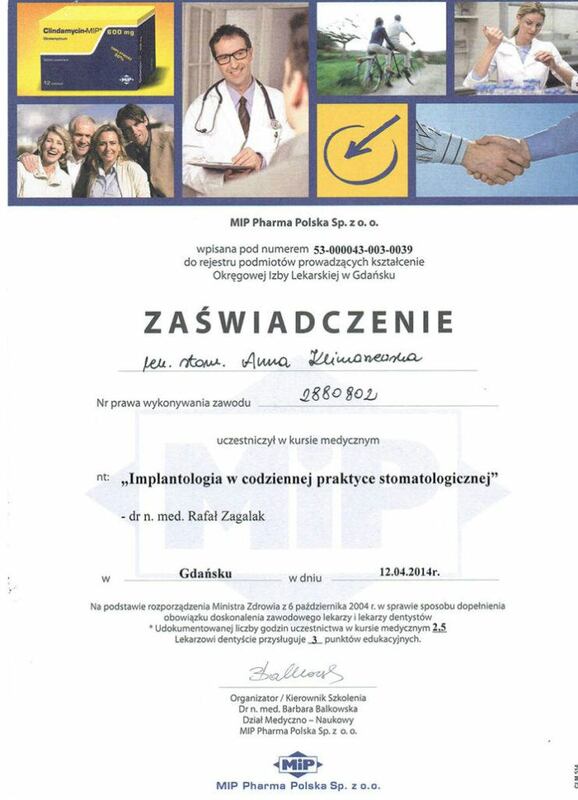 Pricing for treatment I received and was always extremely reasonable and can not compare to the price in Icland. 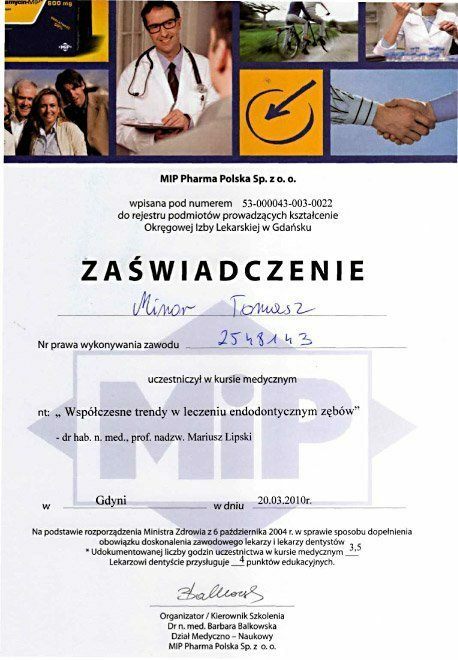 And also I am very thinkful for the service of Mr. Peter's taxi to and from the airport and all over town. 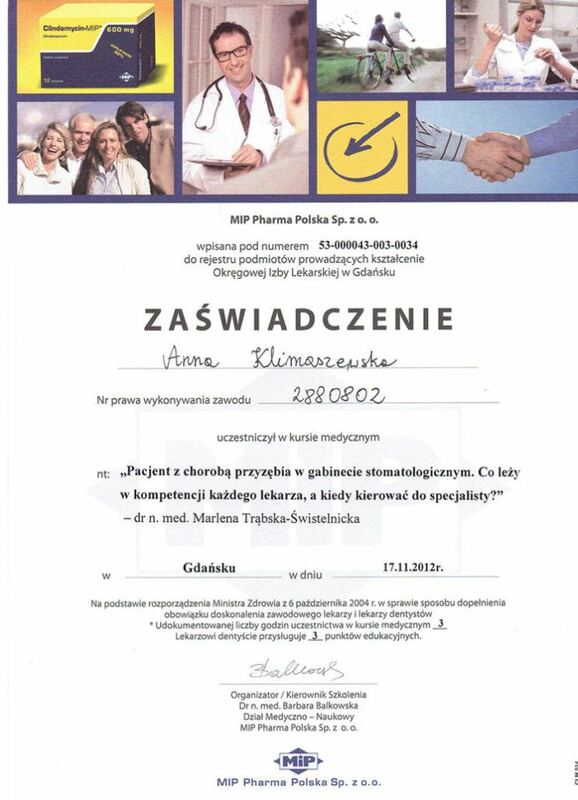 Only thing that I could complain a litle about is that I had to wait for servise up to an houer several times, but it really did´nt matter because I had not much else to do during my treatment. 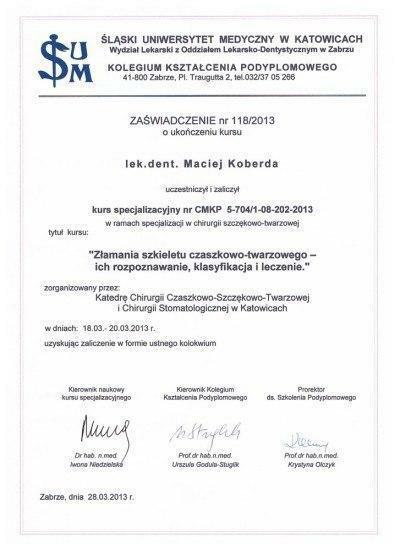 I highly recommend the clinic wto anyone in need of dental care, especially if it is of a complex kind.... 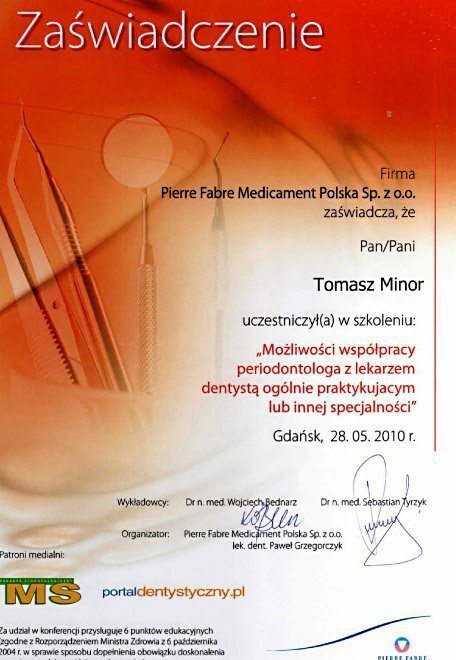 If you are thinking of getting your teeth fixed... do not hesitate to contact Mr. Patryk Becker at the Project Smile clinic immediately. 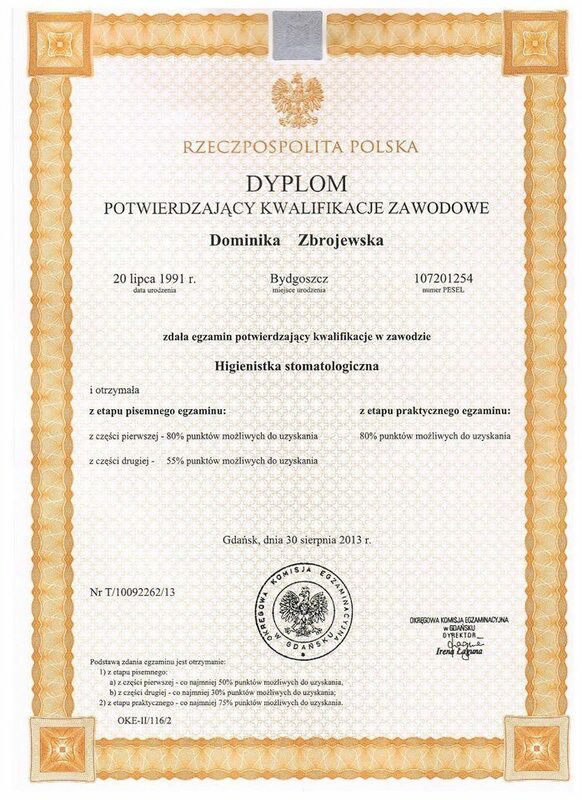 I am quit sure that you will never have a cause for regret. 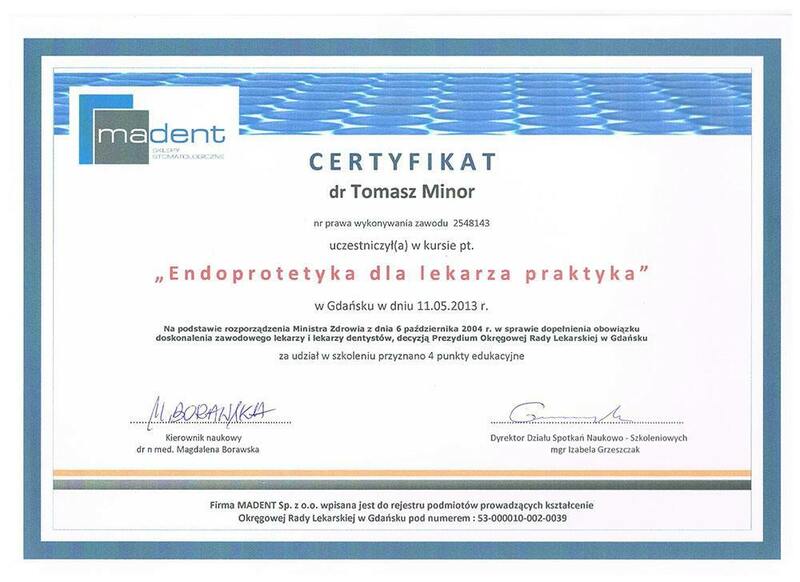 Ég mæli eindregið með Project Smile. 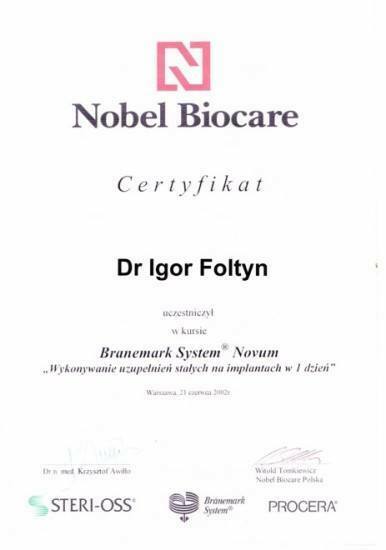 Ég fór í fjögur skipti, fékk 8 implönt og postulínsbrýr að lokum og er svo himinlifandi að geta nú brosað og ekki hvað síst... að tyggja mat og borða vandræðalaust. 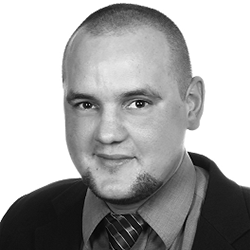 Stofan er mjög nútímaleg með frábærum, kurteisum, nærgætnum tannlæknum sem eru mjög færir í sínu fagi Hikið ekki við að hafa sambandi við Patryk, bæði hægt að senda tölvupóst og líka hringja.. og fáið ráðleggingar. 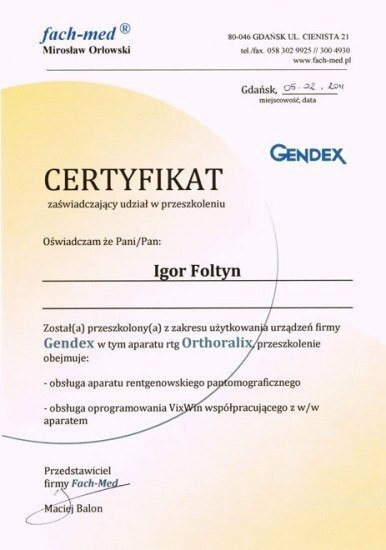 Það er líka hægt að skreppa til Gdansk í einn tíma og fá faglegt mat og kostnaðaráætlun. 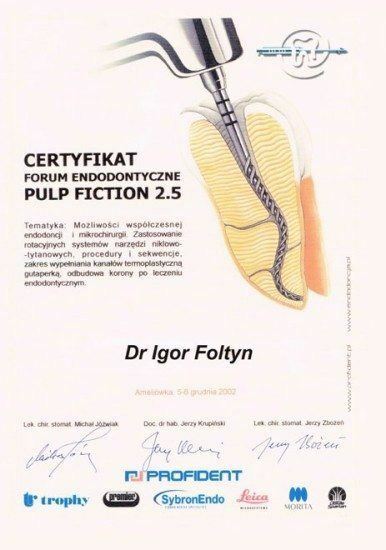 Had my main two front teeth crowned here by Dr Maciej. 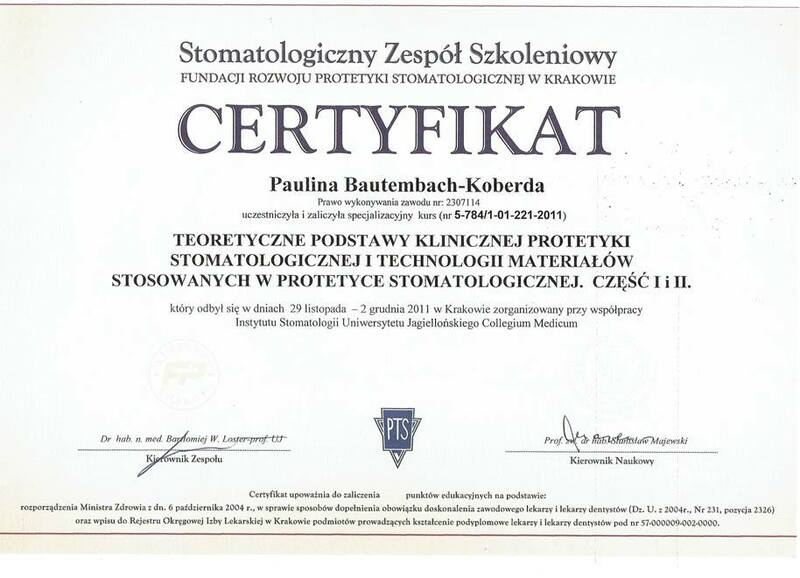 Really happy with the work that has been done. 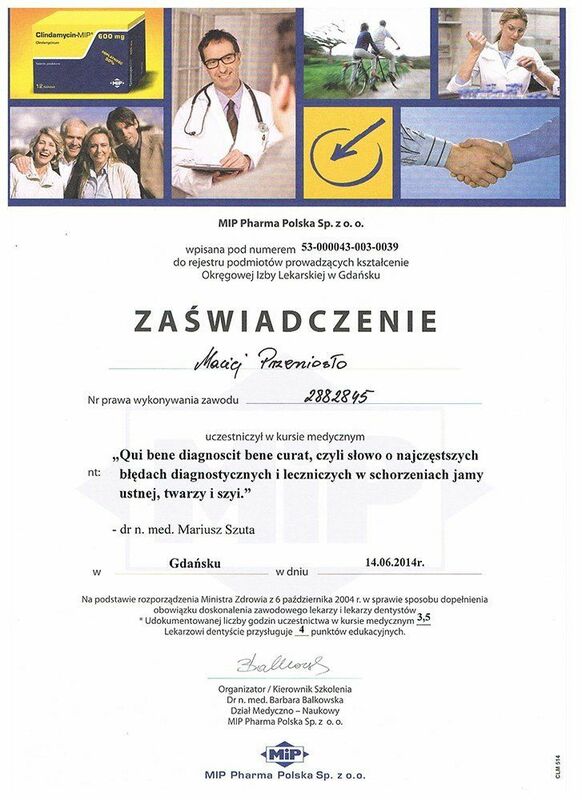 Found the clinic and team very professional. 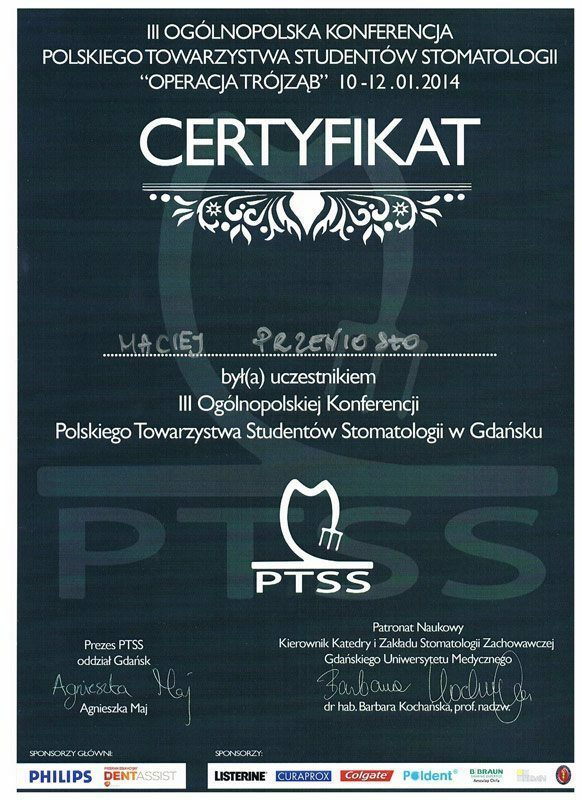 Everything done on time and a perfect result to go home with. 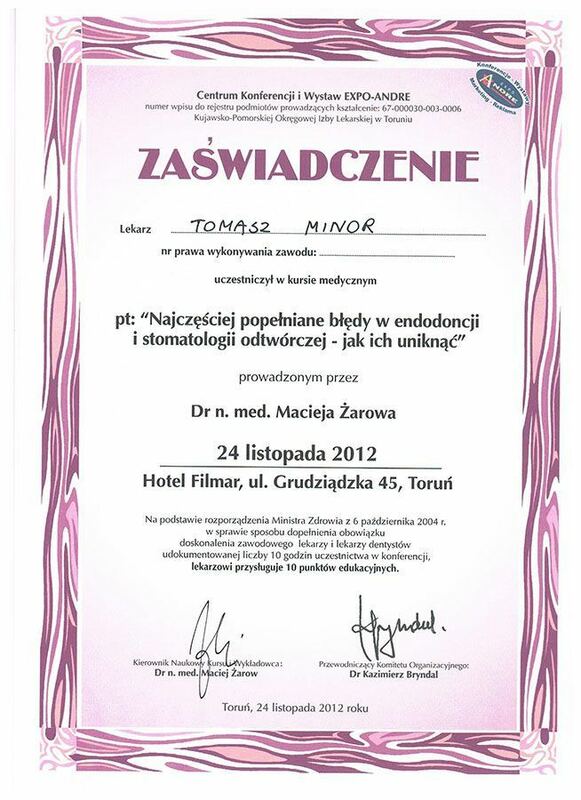 I highly recommend this clinic. 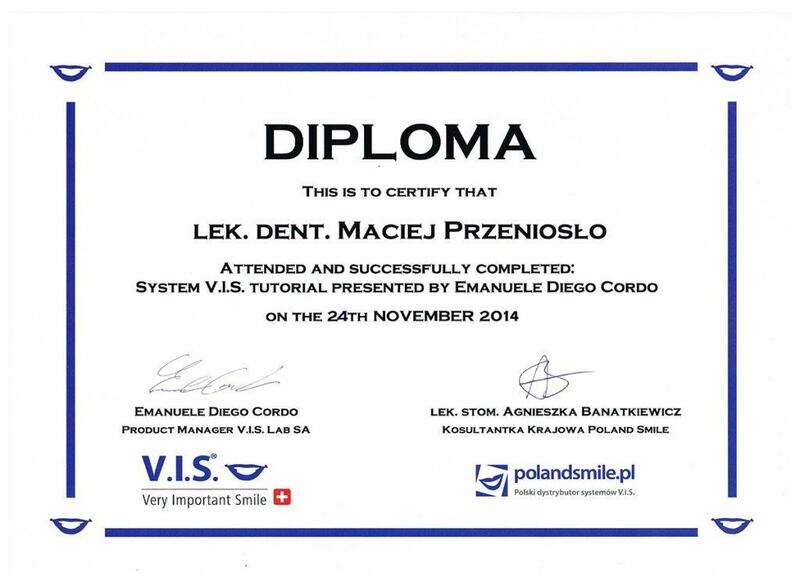 From my first tentative questions to them and throughout the booking, the service was superb. 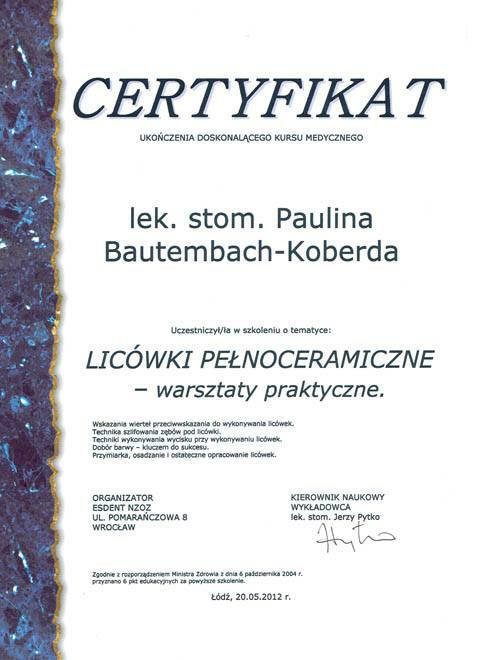 We stayed 1 week on the first visit and 2 weeks on the second visit at their Waterlane apartment. 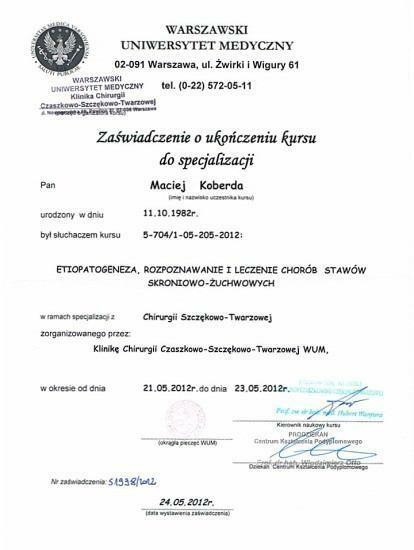 The accommodation is a very reasonable price, they also have at our time of staying probably the best cleaner out there, Irene, (Thank you) I have stayed in some nice hotels in my lifetime and I notice tiny little things when it come to cleanliness, this place is spotless. 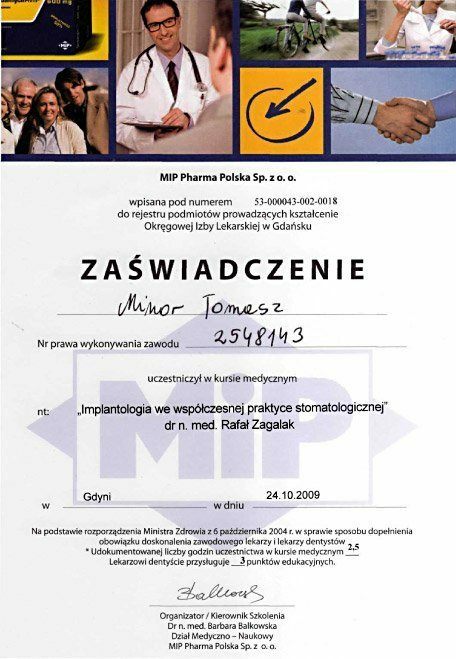 They arrange for Mr Peter the taxi driver to pick you up from airport and all of your appointments, what can i say about him, " He's a Legend" I had such a laugh with him on the many rides to and from the clinic. 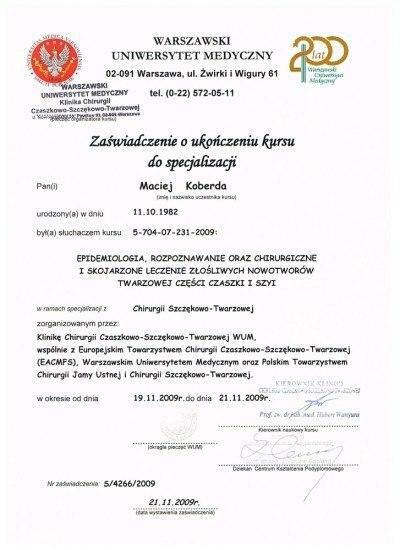 His English is far better than my polish ! 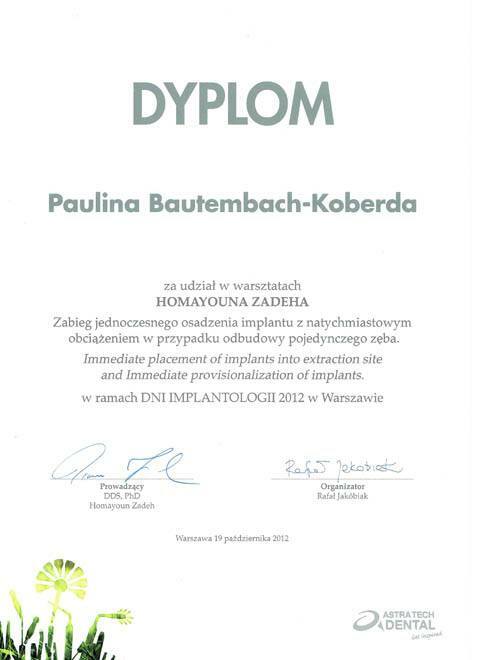 (Thank you) Patryk Becker arranges everything from the first email to the last details after I arrived home ( Thank you) My team of dentists on my first visit were Dr Maciej Koberda and Dr Paulina Bautembach-Koberda who assessed me and came up with the plan for me, Dr Maciej did the extractions etc and Dr Paulina did all the other dental magic in preparing the crowns and bridges ( I think I love her! ) 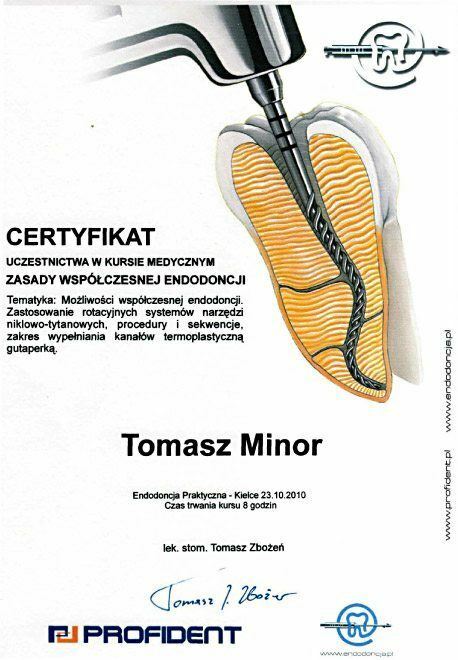 Dr Tomasz Minor did the root canals, I dont love him ! 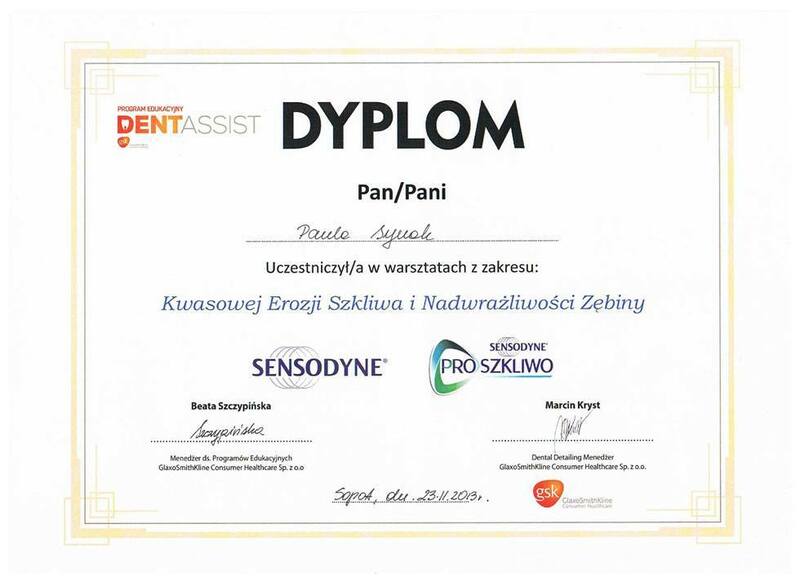 A huge thank you to you all, and the dental assistants. 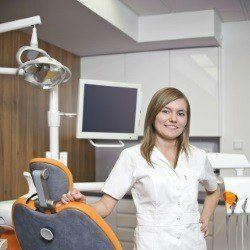 My experience throughout the whole process was very professional, not always comfortable but thats no detriment to them, after all, your at the dentist, but they made me comfortable and answered all my questions superbly. 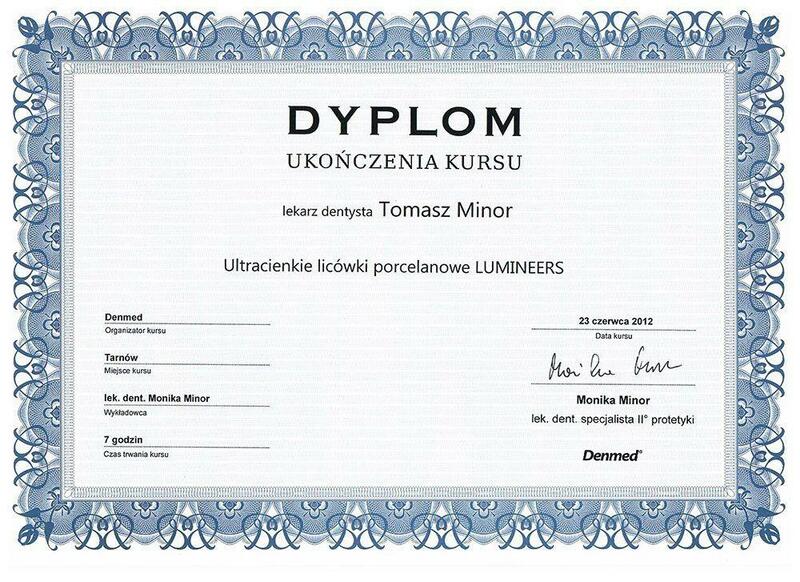 If I ever need any major work done again, im going back. For those reading this and wondering about price needless to say its probably at least half, if not more cheaper than in the UK. 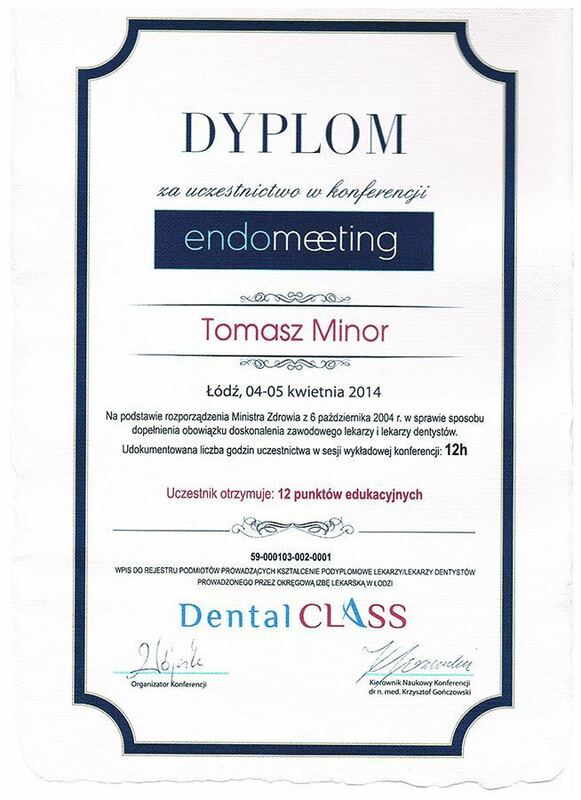 Thank You all for giving me my smile back. Nice clinic, friendly doctors (girls on reception was just non attentive). 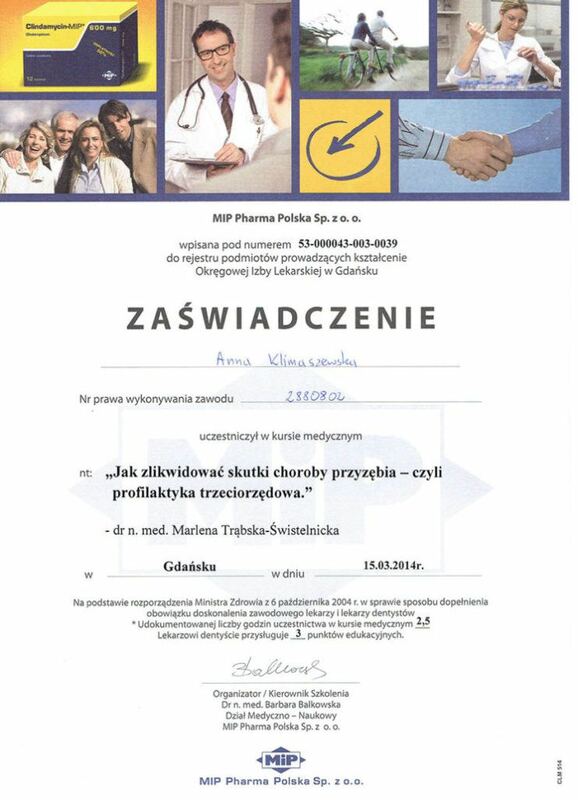 Waited over 25 min to bee seen (even had an appointment booked). 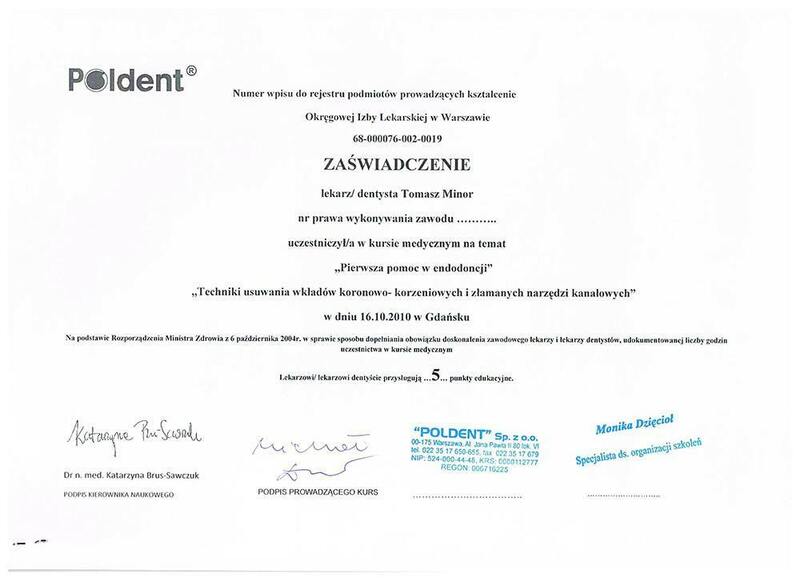 Had consultation, examination and CT scan, which say on website that is free but had to pay over £71 for that (which in UK for that price in private dental I normally pay that amount for consultation, examination, X-ray and hygiene cleaning). 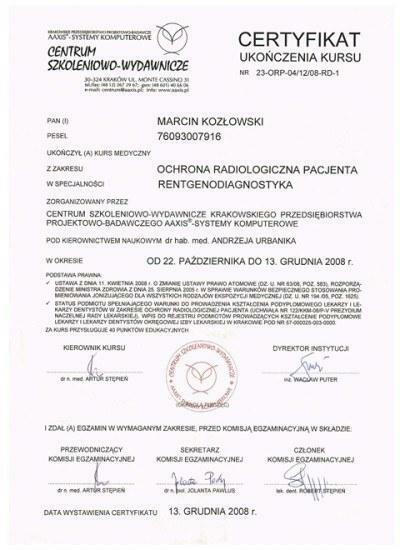 Been told that will be given copy of CT scan on CD but haven’t had it. 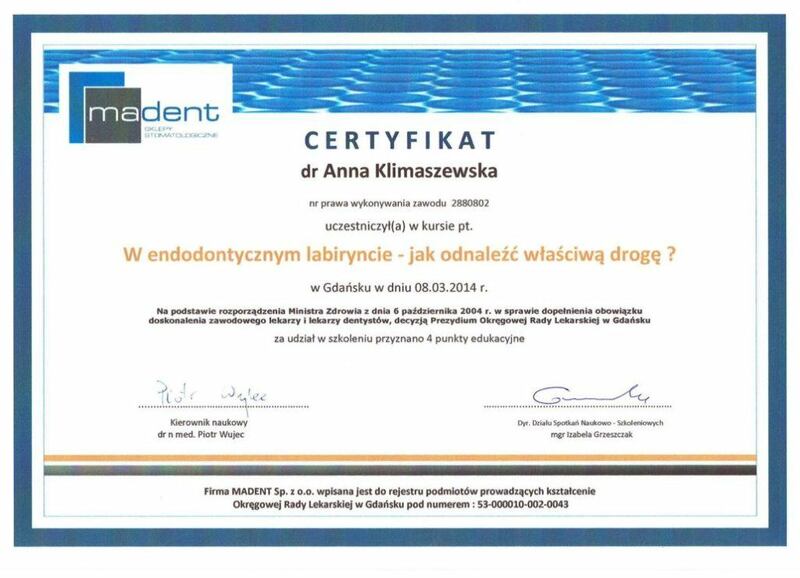 Had a quote and it slightly cheaper then in private dentist UK but add up flights and hotel then I wouldn’t really safe. 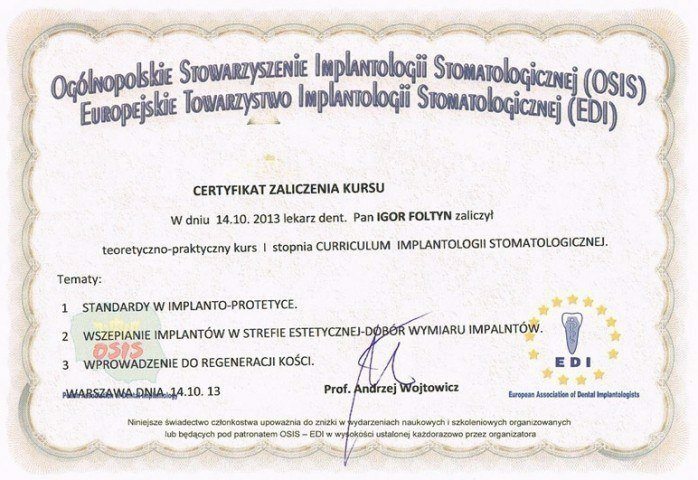 Treatment: Multiple implants, crowns and related treatment. 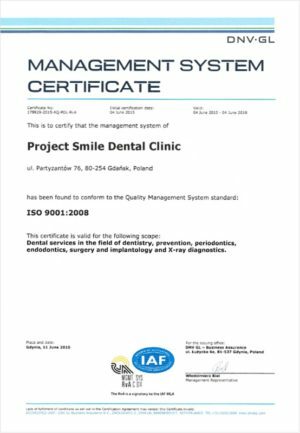 We cannot speak highly enough of the treatment my wife and I received during our four visits to the Project Smile clinic. 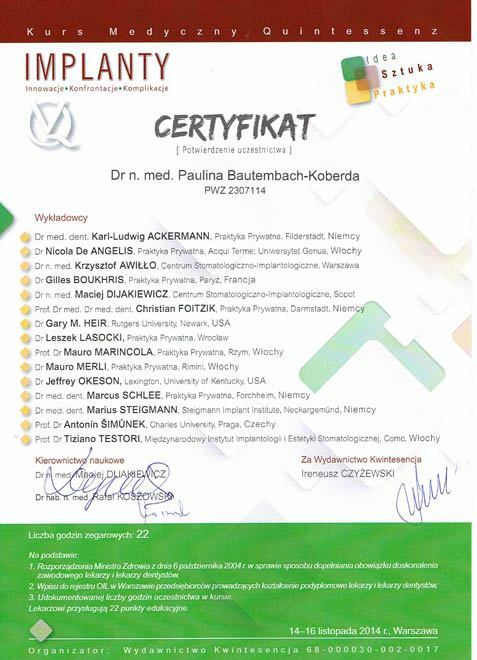 From our initial contact with Mr. Patryk Becker, every aspect of our treatment was clearly laid out and help given in arranging transport and accommodation. 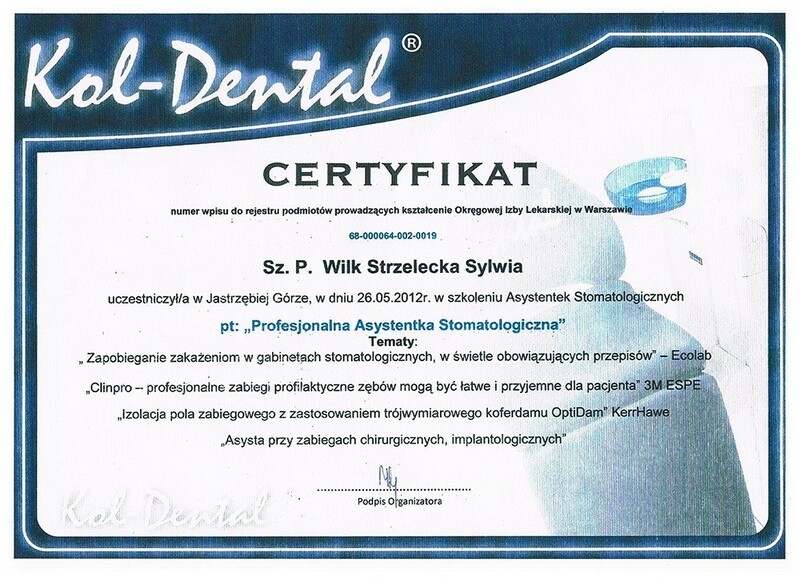 Because we always saw the same two dentists, we valued the continuity of treatment we received. 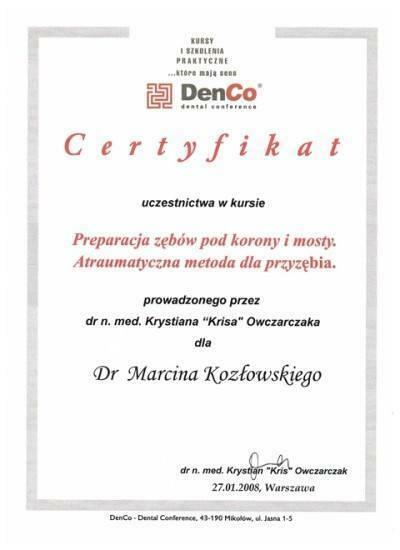 The dentists themselves combined an extraordinarily high standard of professional skill with an unfailing civility and courtesy. 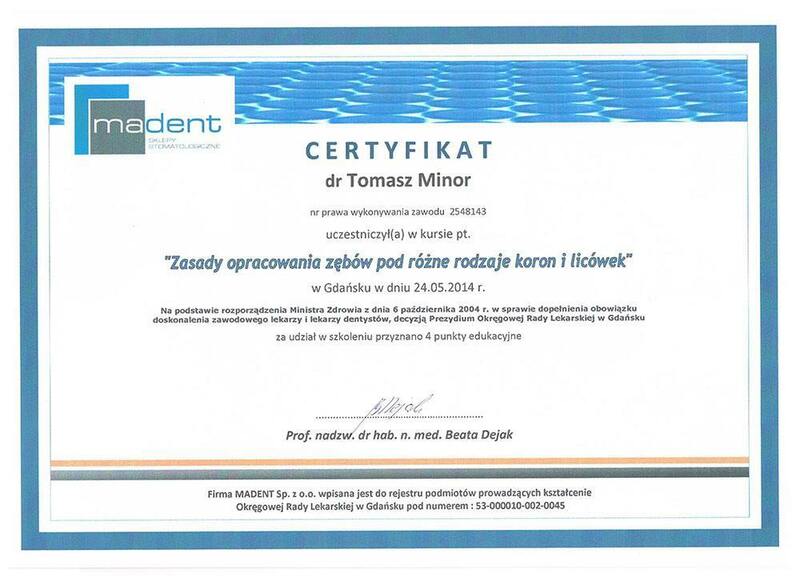 It was a great pleasure to meet them, and a privilege to enjoy the uncompromising level of dental care they provided - exceeding as it always did the level we had experienced in the UK. 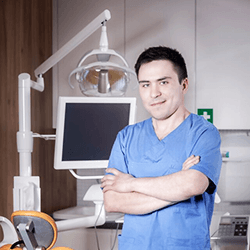 The surgery itself is impressively equipped with the latest dental technology. 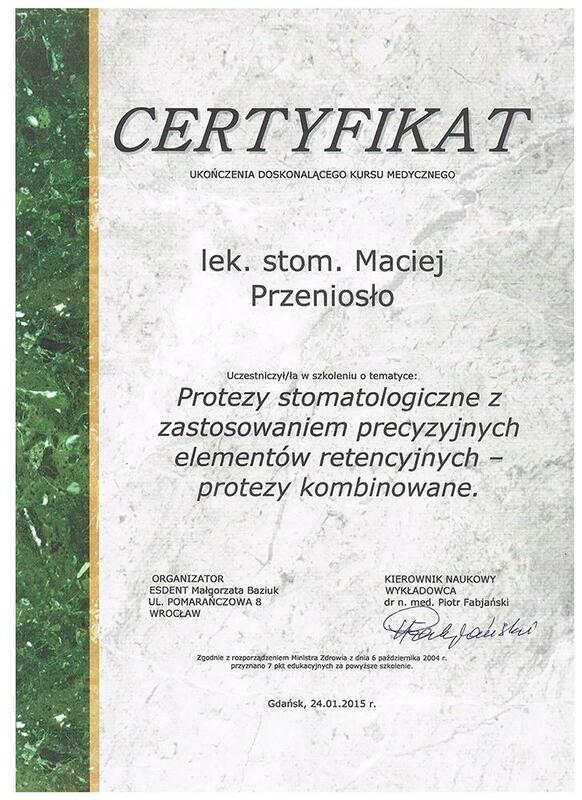 Pricing for treatment we received and could not have afforded in the UK was always extremely reasonable. 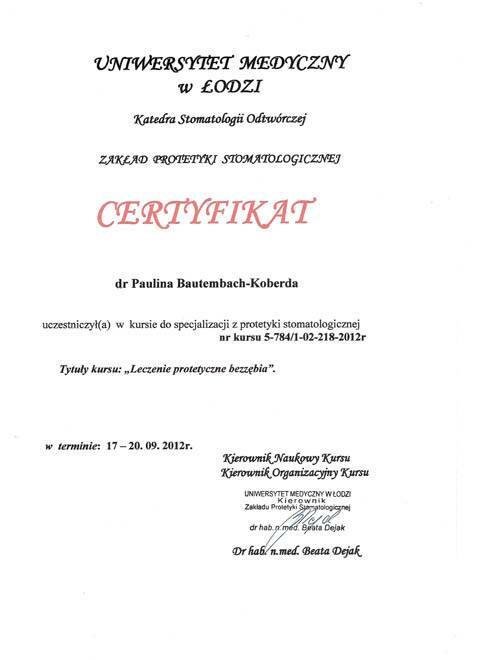 Last but not least, the general back -up service for our visits arranged by Mr. Patryk Becker, from being met by Mr. Peter's taxi at the airport to booking affordable accommodated in a hotel near the clinic, was outstanding. 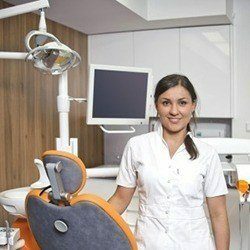 We have no hesitation whatsoever about recommending anyone in need of dental care, especially if it is of a complex kind, to contact Mr. Patryk Becker at the Project Smile clinic immediately. 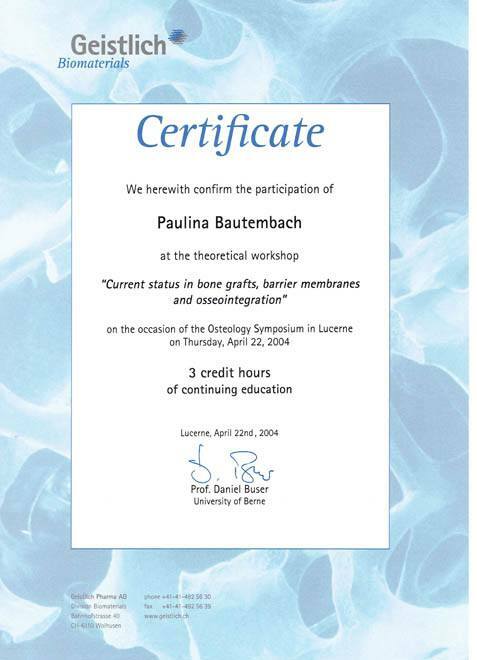 Those who do so will never have the slightest cause for regret. 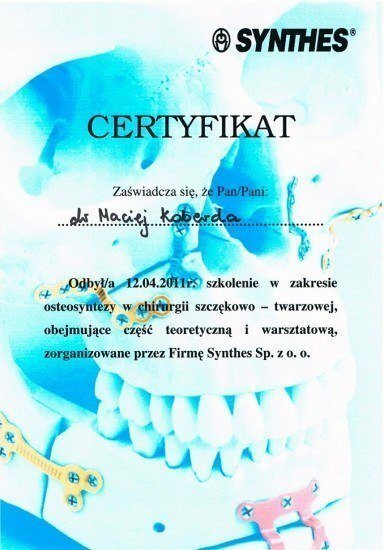 I went to this dentist to get a bone augmentation because my dentist in my country said I needed that. 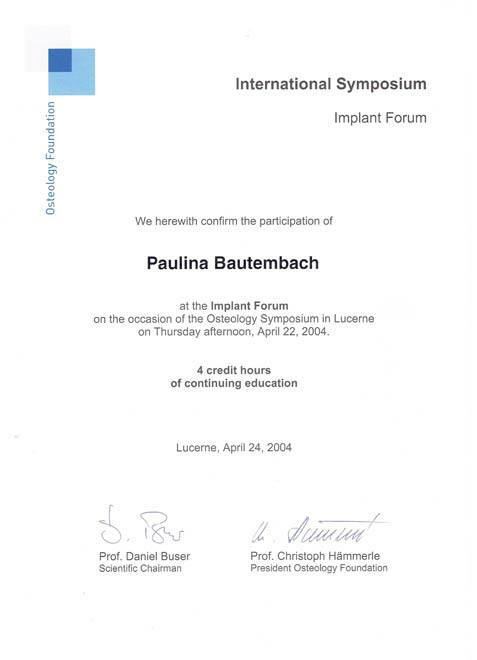 However, this doctor said that I did not need that to get an implant. 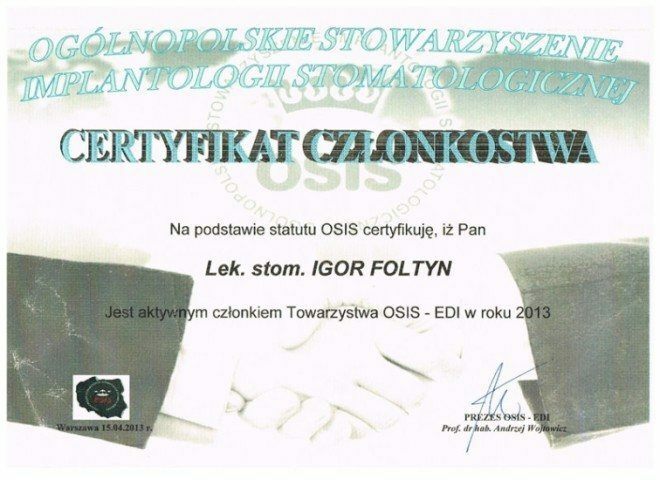 They were extremely professional and fair. 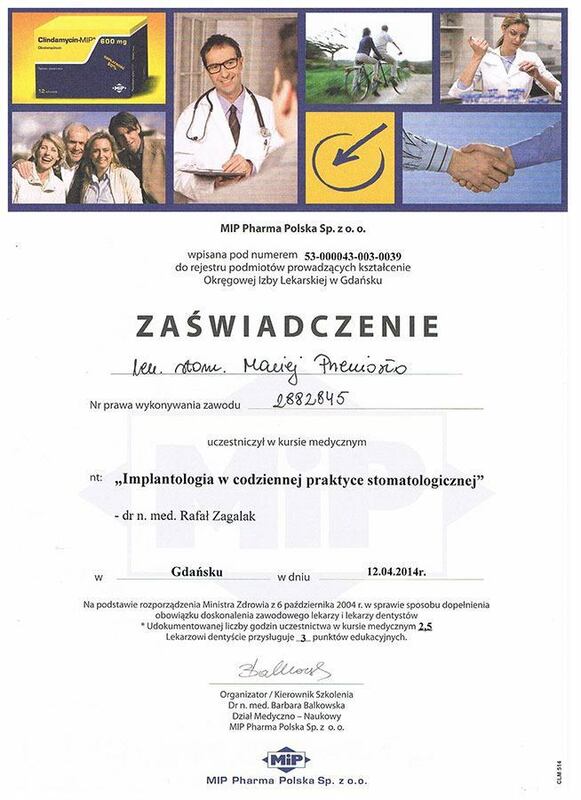 I got a good explanation and they began the treatment for implants. 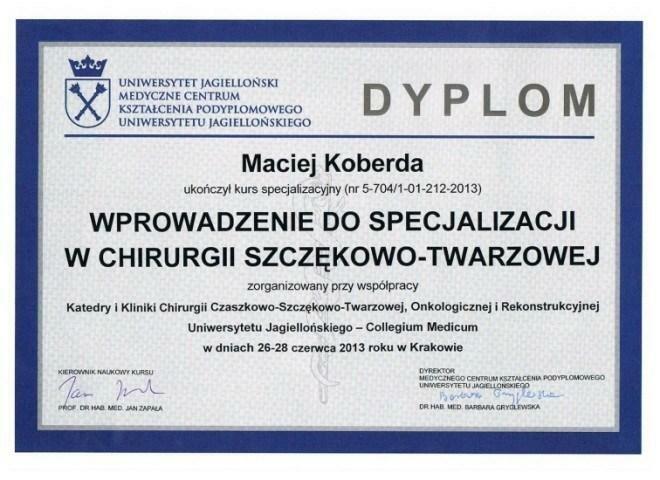 Extremely good experience.